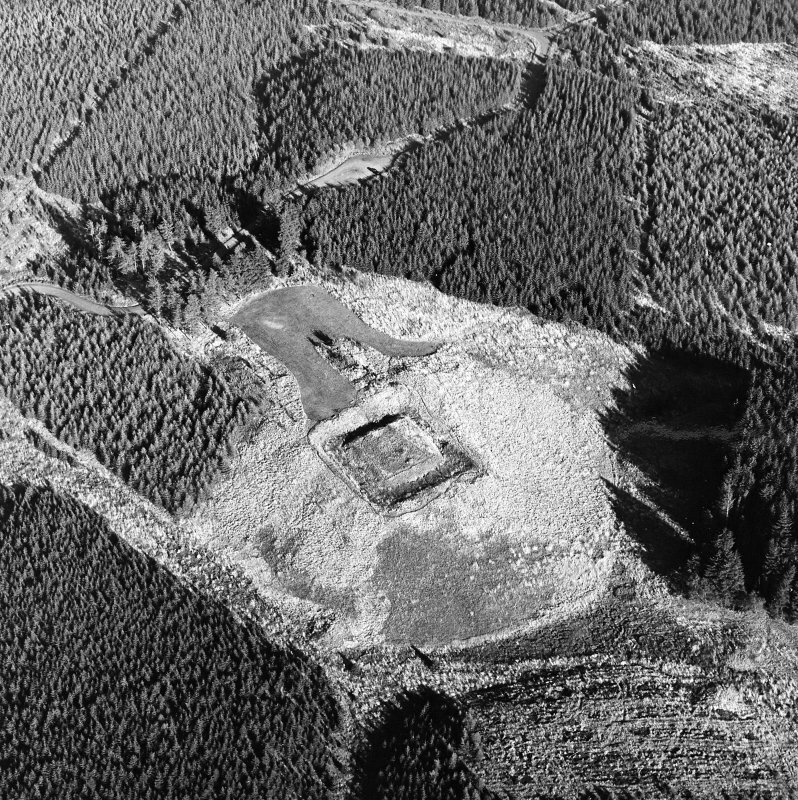 Oblique aerial view of Sir John de Graham's Castle centred on the remains of a motte and bailey castle, taken from the ESE. 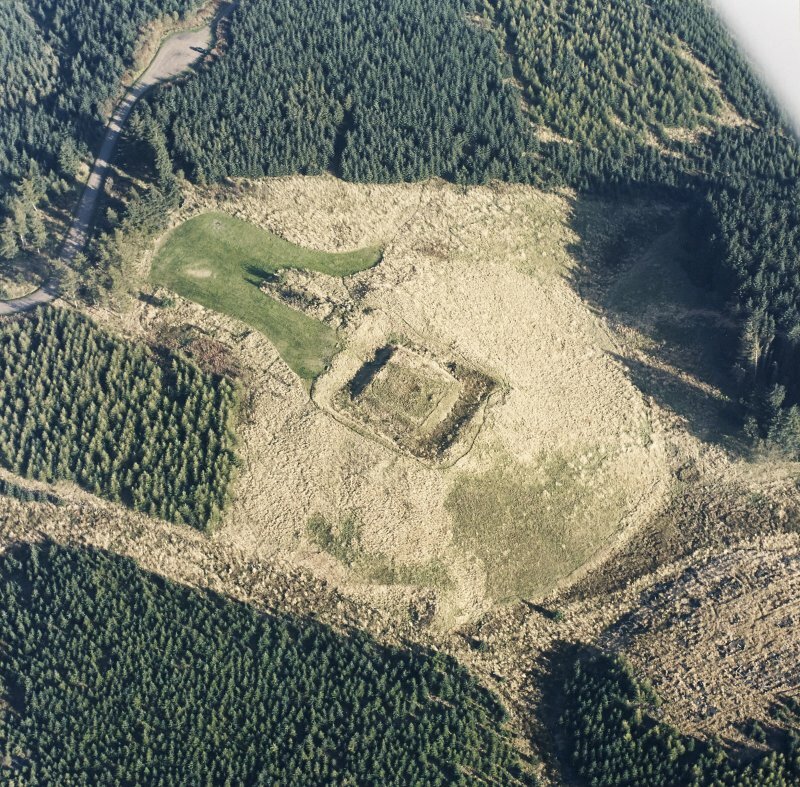 Oblique aerial view of Sir John de Graham's Castle centred on the remains of a motte and bailey castle, taken from the WNW. 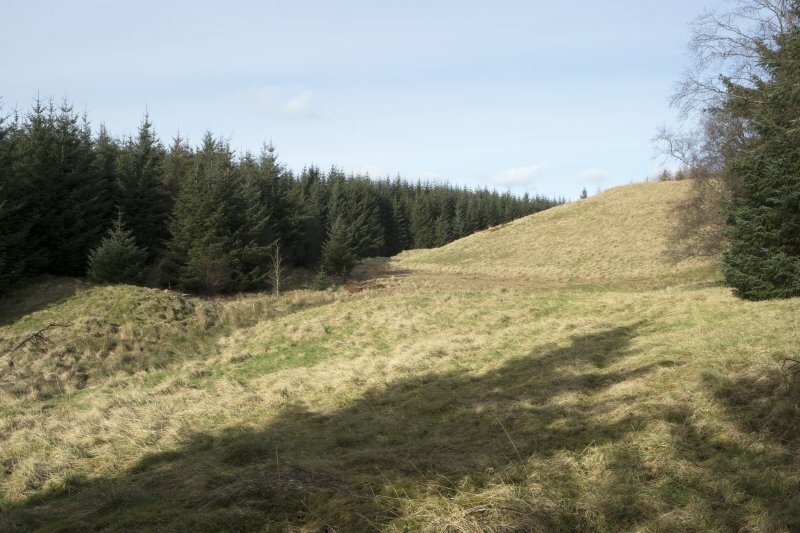 View from north east of slope to south of castle. 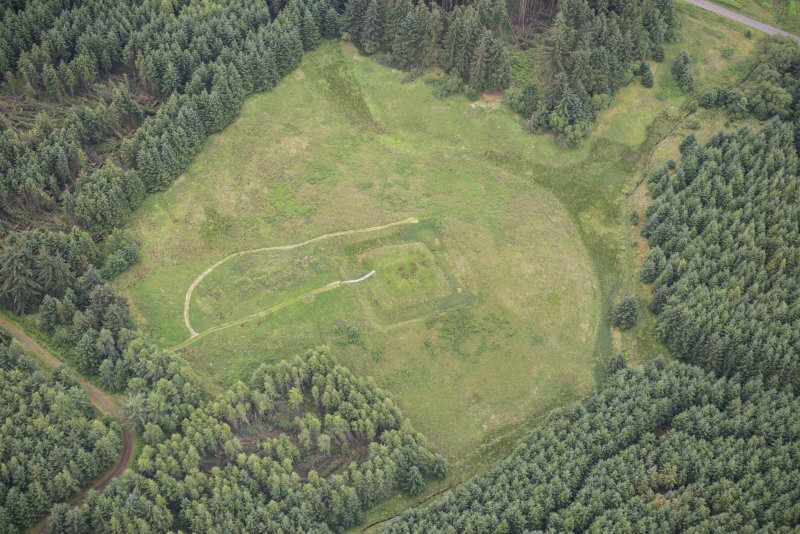 Castle enclosure, view from north-east. 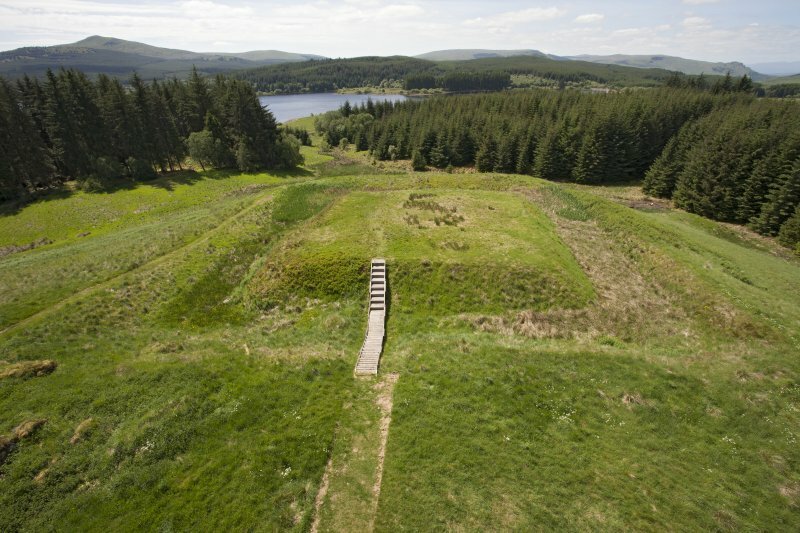 Castle enclosure, view from north west, showing building platform. General view from south west. Dam wall on left. 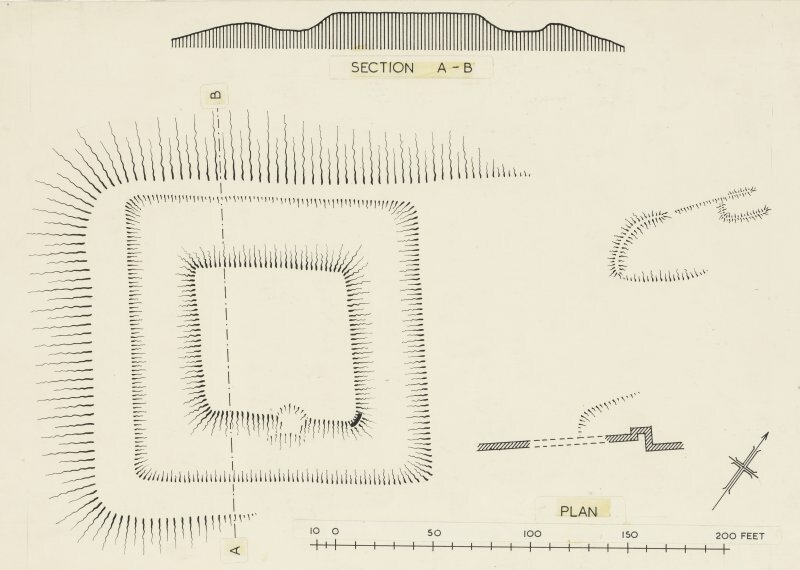 Sir John De Graham's Castle, detail plan of motte. 300dpi copy of GV006415. 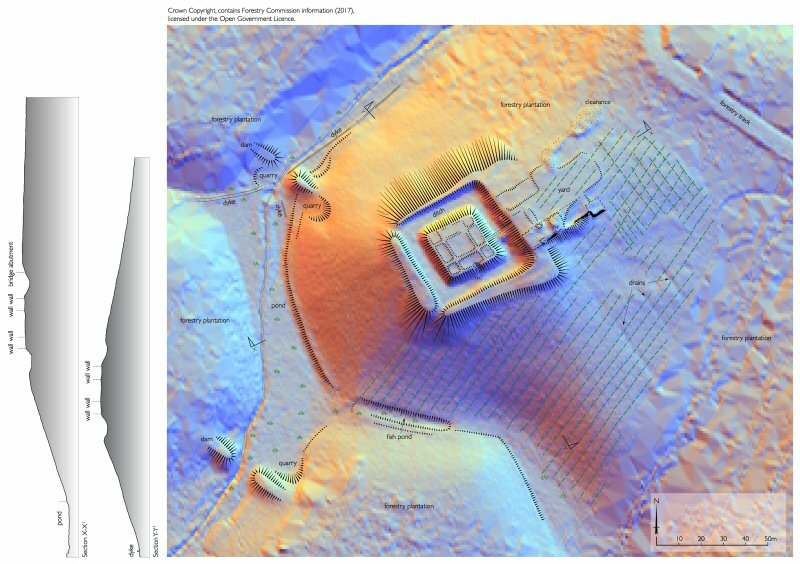 Plane-table survey; motte, Sir John de Graham's Castle. 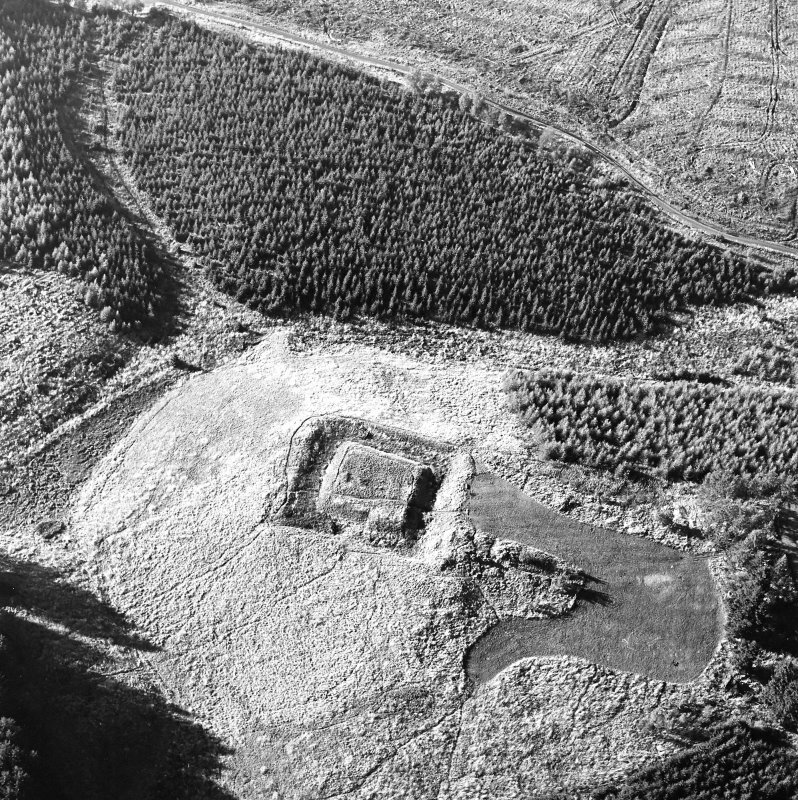 Oblique aerial view of Sir John de Graham's Castle centred on the remains of a motte and bailey castle, taken from the SE. Plan of Sir John De Graham's Castle. 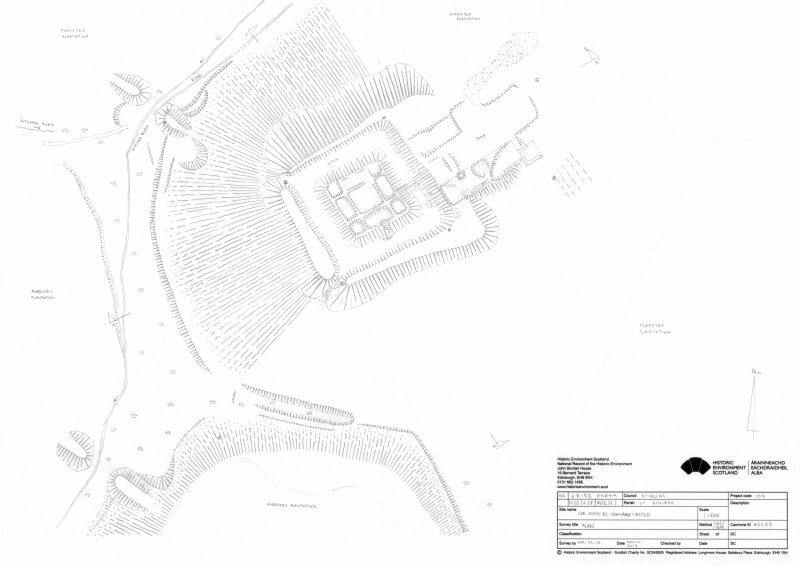 Sir John De Graham's Castle, site plan and sections. 300dpi copy of GV006413. 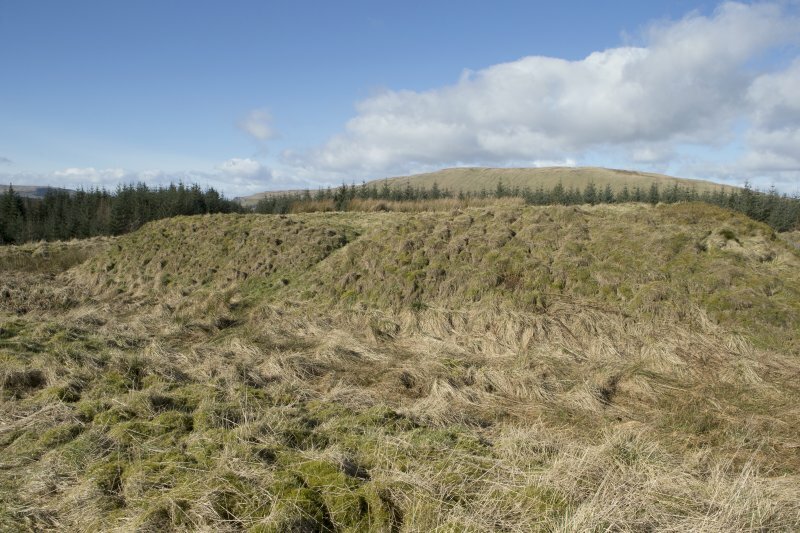 Castle enclosure, view from north west. 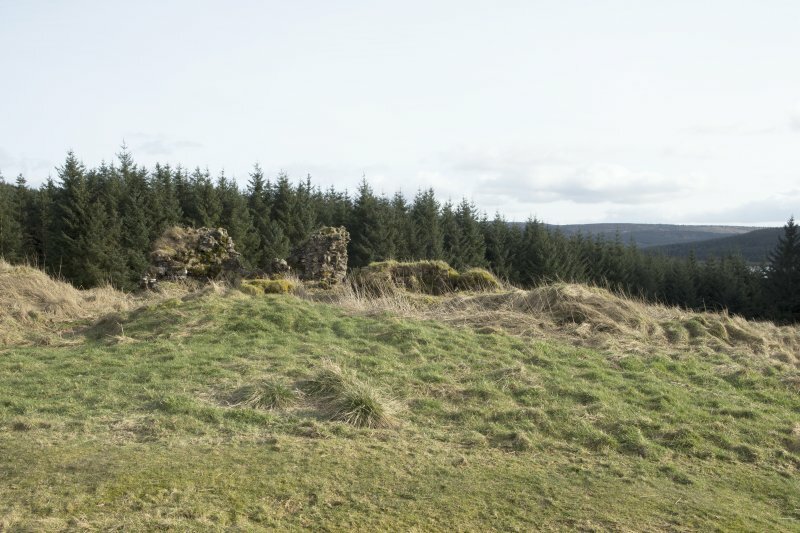 Buildings to east of castle, general view from north east showing hollow behind the south-east wall. Buildings to east of castle, view from south. Garedrobe and turret. 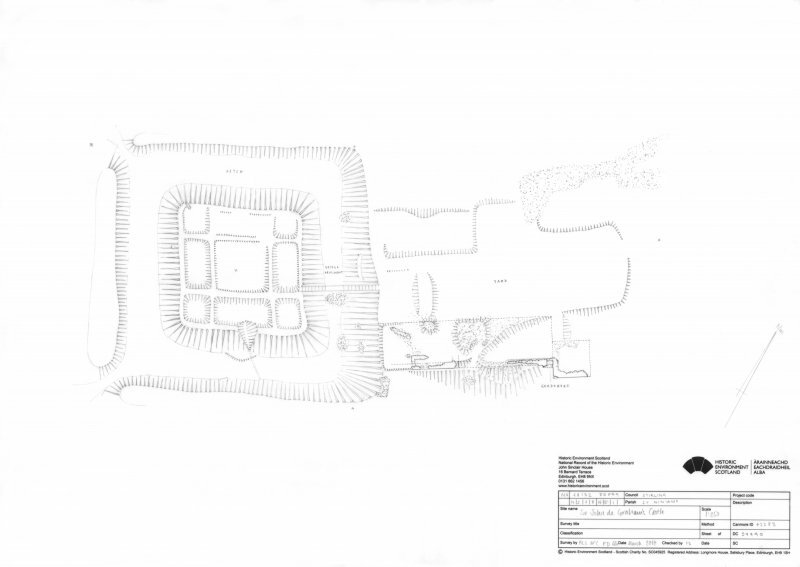 Site plan of Sir John De Graham's Castle. 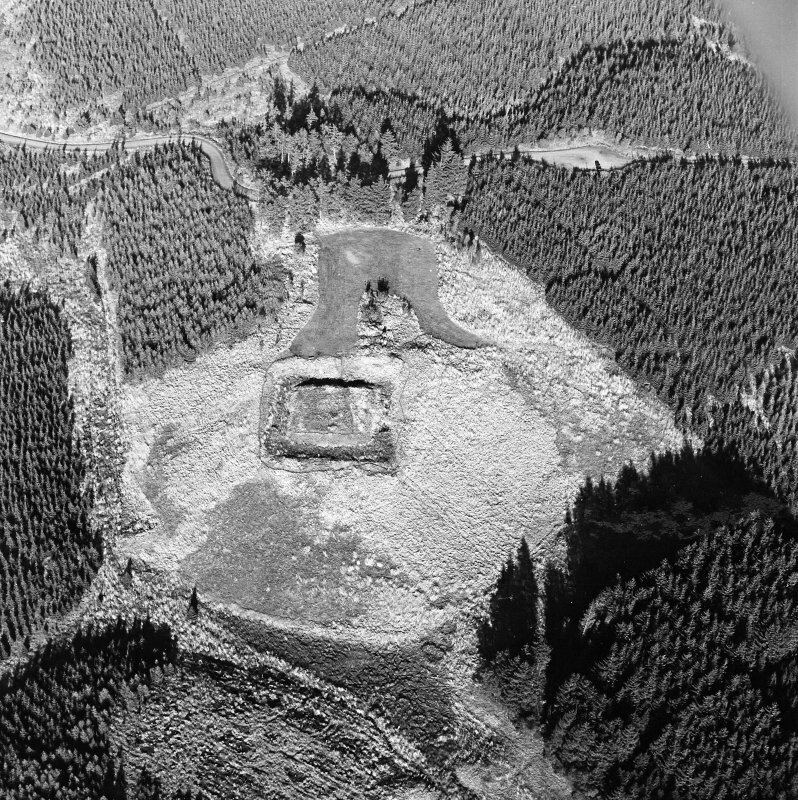 Oblique aerial view of Sir John de Graham's Castle centred on the remains of a motte and bailey castle, taken from the S.
Oblique aerial view of Sir John de Graham's Castle centred on the remains of a motte and bailey castle, taken from the SW.
Oblique aerial view of Sir John de Graham's Castle centred on the remains of a motte and bailey castle, taken from the W.
Buildings to east of castle, view from south. South-east wall of turret. 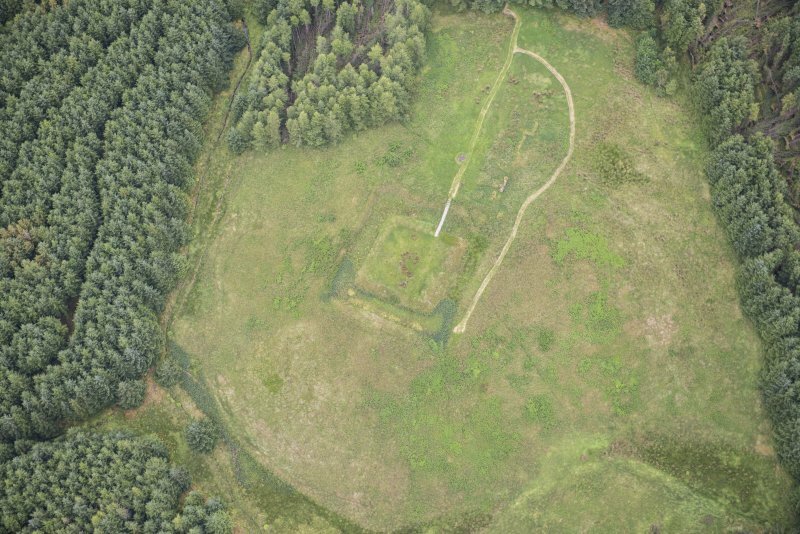 Oblique aerial view of Sir John de Graham's Castle centred on the remains of a motte and bailey castle, taken from the N.
General view of castle mound from west. Dam walls to either side of foreground. Buildings to east of castle, view from east. Turret in foreground. 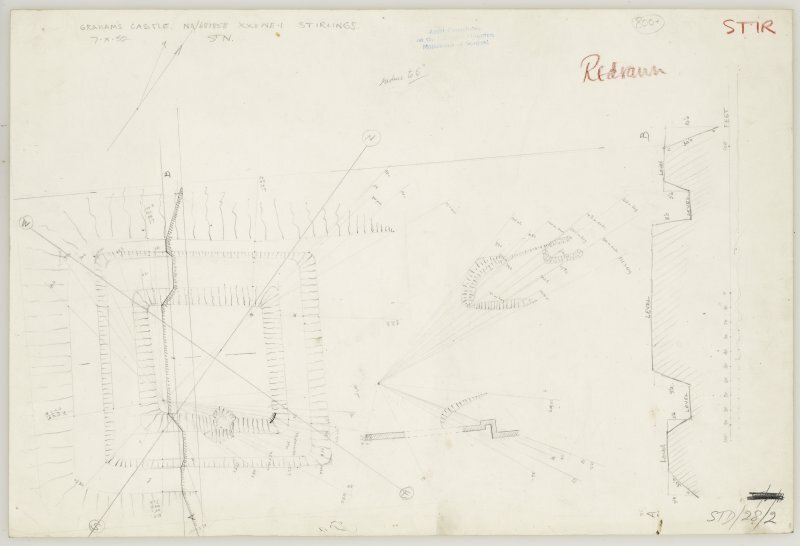 Survey drawing, Sir John De Graham's Castle: sections. 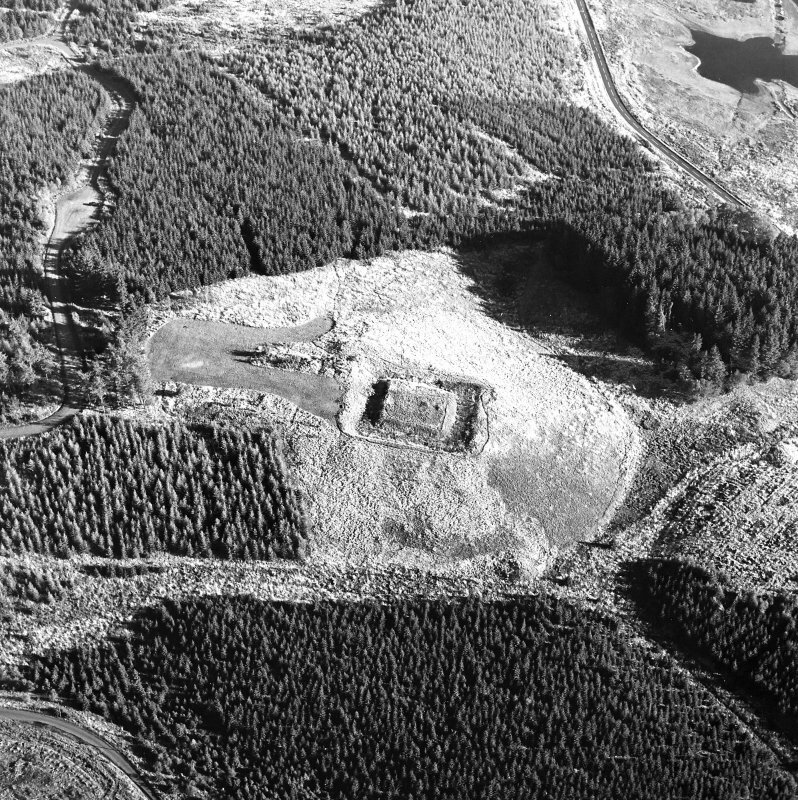 Oblique aerial view of Sir John de Graham's Castle centred on the remains of a motte and bailey castle, taken from the NW. 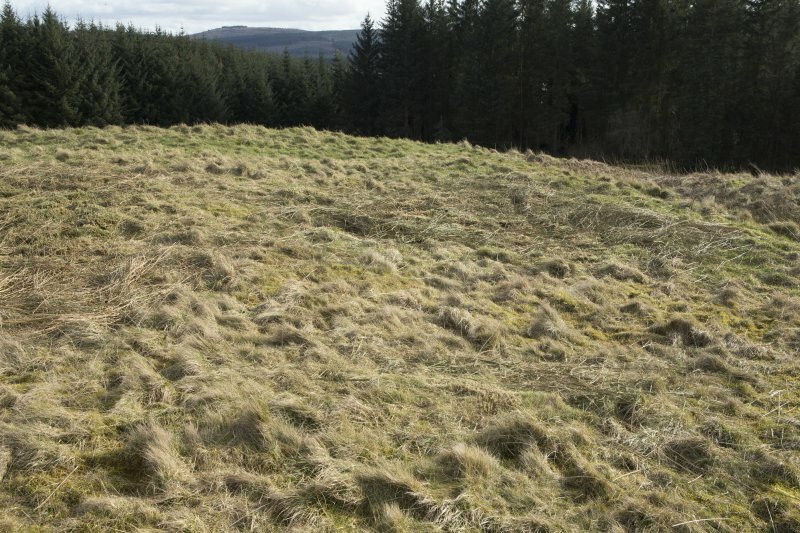 Slope to north of castle, general view from east. Dam wall in background beside the trees. 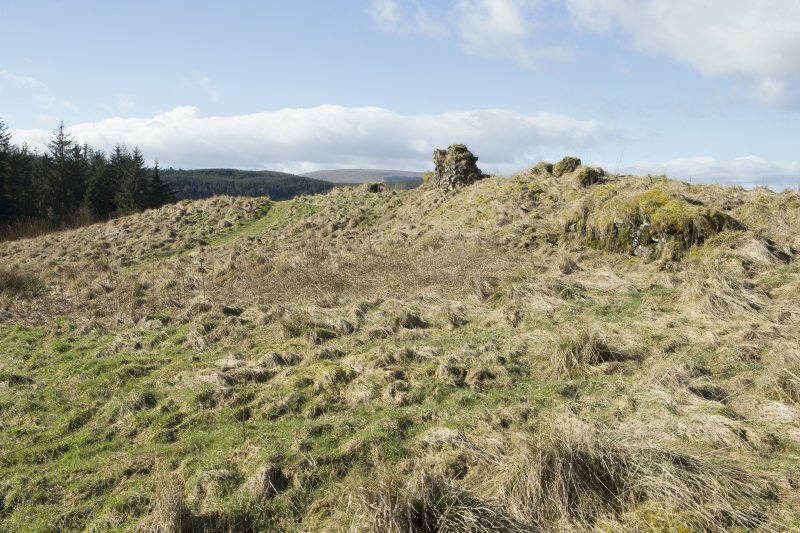 Buildings to east of castle, view from east of south-east wall of turret. 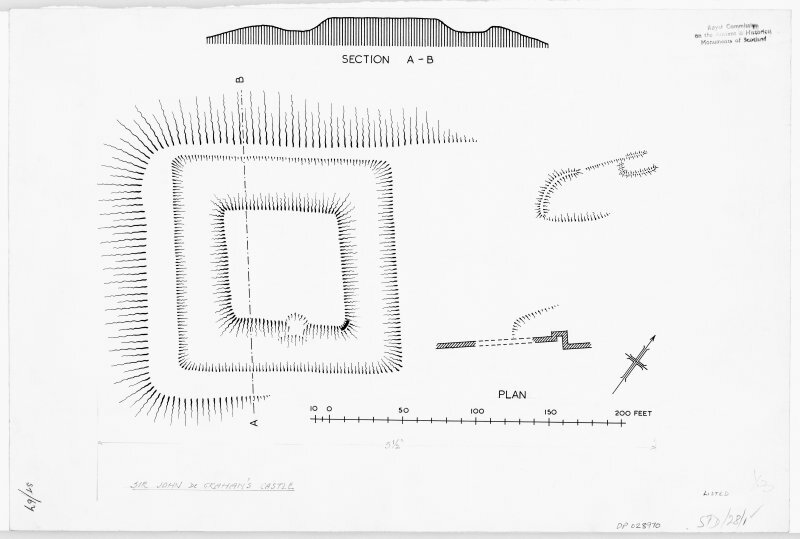 Publication drawing; motte, Sir John de Graham's Castle. Yard in castle enclosure, view from east. 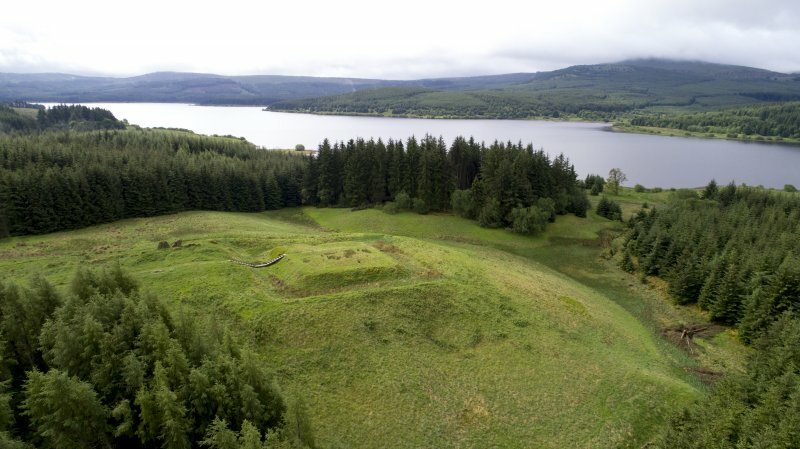 Buildings to east of castle, view from south. Garderobe chute. 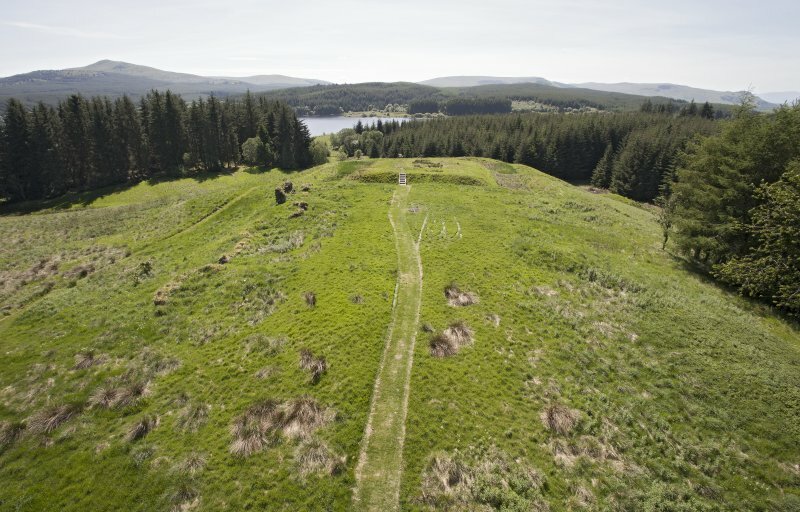 Sir John de Graham's Castle, a motte, occupies a commanding position on a tongue of raised ground near the NW end of the Carron Valley Reservoir. 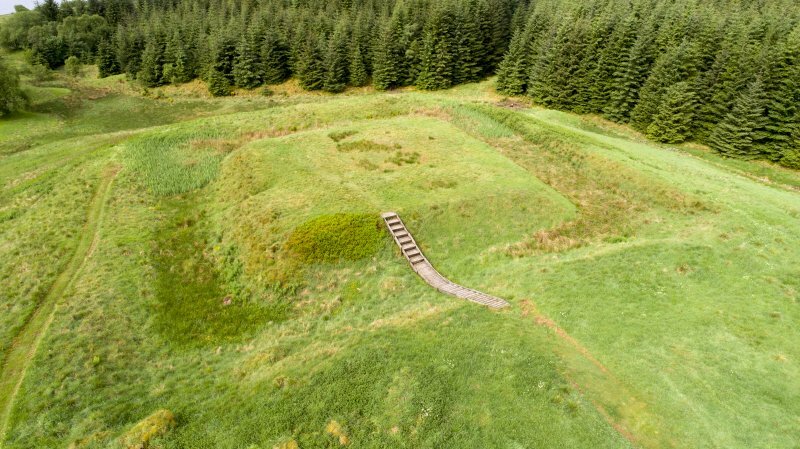 It is almost square on plan measuring 145' NW-SE by 150', and consisting of a central platform, 75' NW-SE by 77', surrounded by a wide, flat-bottomed ditch, access to the platform presumably being by means of a drawbridge. The surface of the platform is at the original ground level. Immediately NE, the broadening surface of the tongue of raised ground bears signs of occupation. 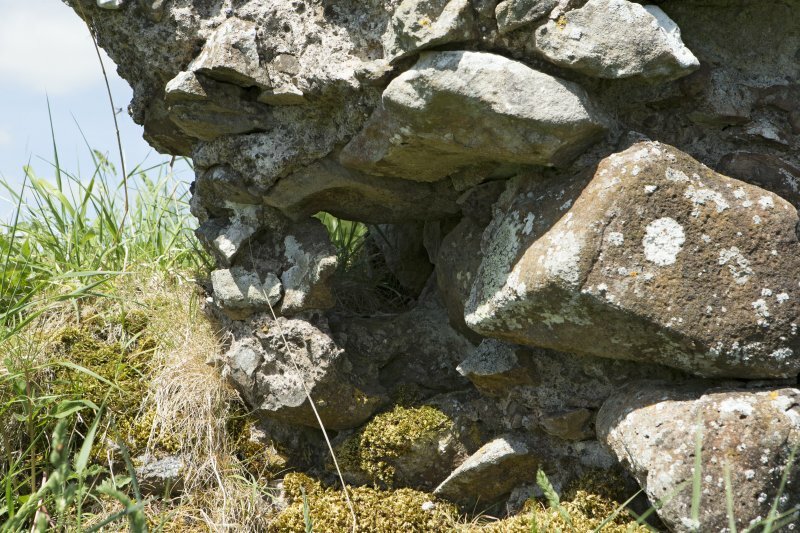 These include a length of ruinous stone wall 3'6" thick, built with lime mortar, together with various fragmentary banks and indeterminate hollows. 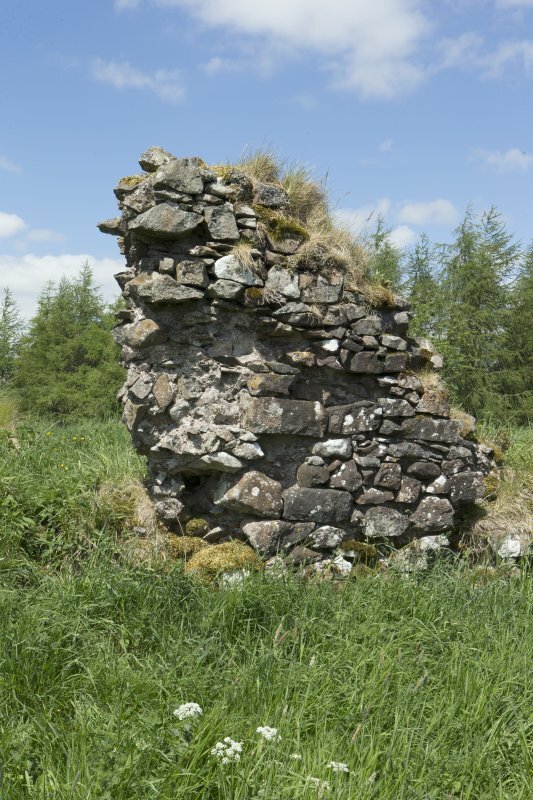 The wall may have formed the SE end of a range of buildings; at its NE end there is a return, in the inner angle of which there may have been a garderobe vent. 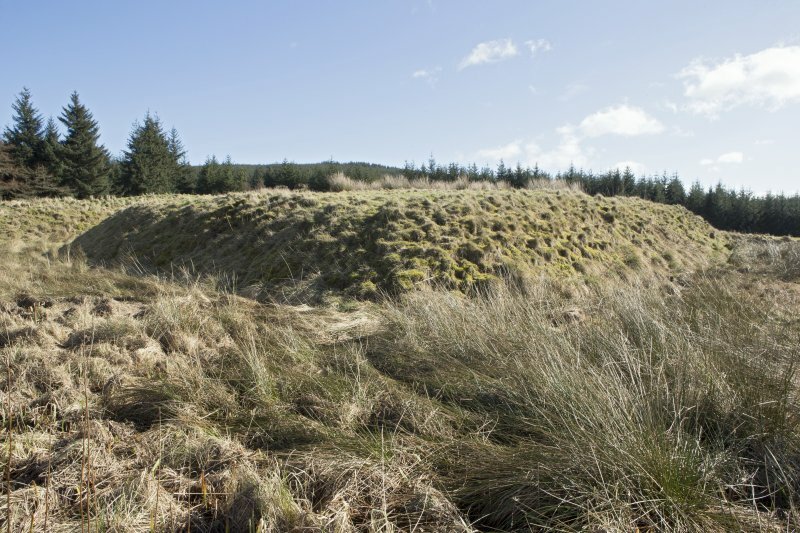 This motte was traditionally the residence of Sir John Graham of Dundaff who was killed in 1298 at the Battle of Falkirk. 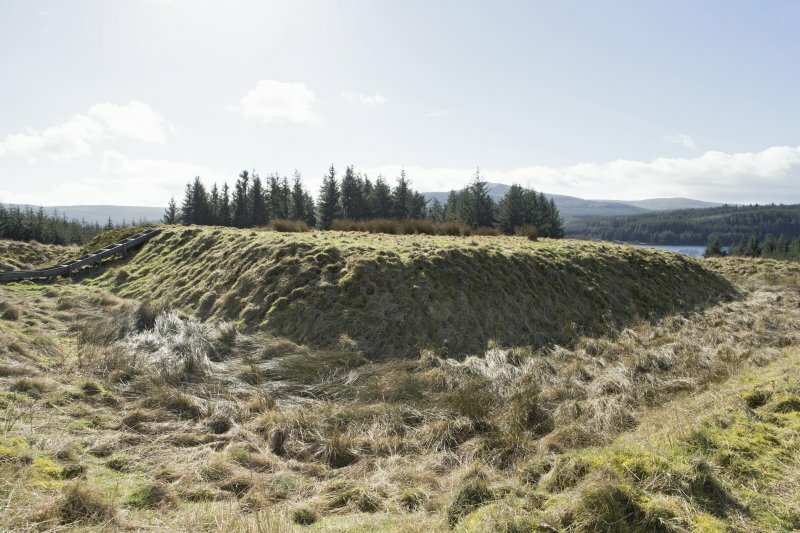 In the absence of excavation, the exact age of the motte is unknown, but there seems no reason to doubt that it formed the principal stronghold of the barony of Dundaff, which was in the possession of Sir David de Graham, the founder of the house of Montrose, in 1237. 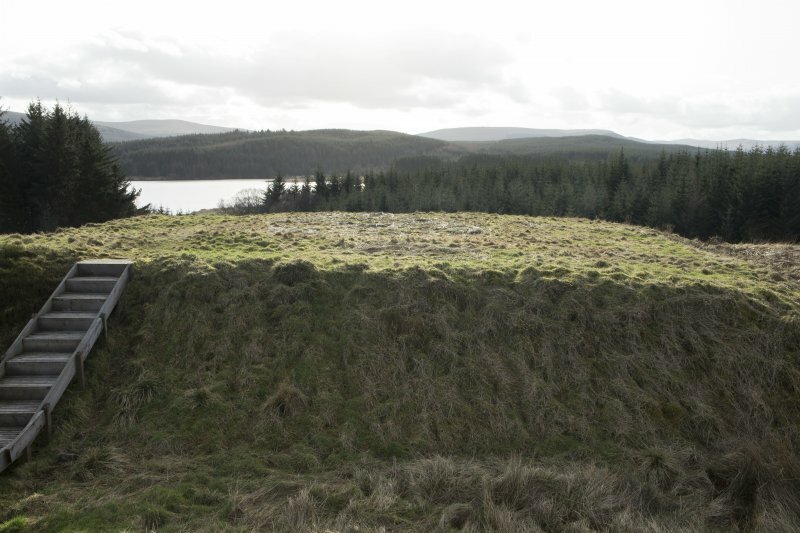 Sir John de Graham's Castle, a motte with bailey, is generally as described by the RCAHMS. 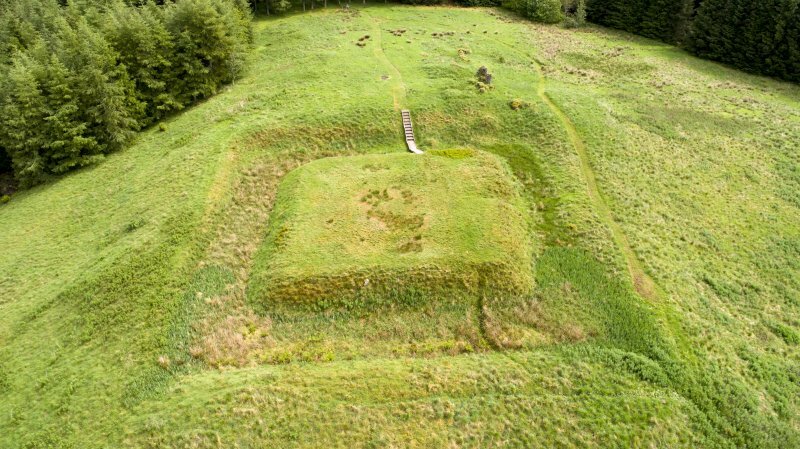 The ditch surrounding the motte is sharply defined, and is 4.0m - 5.0m in breadth at its base. 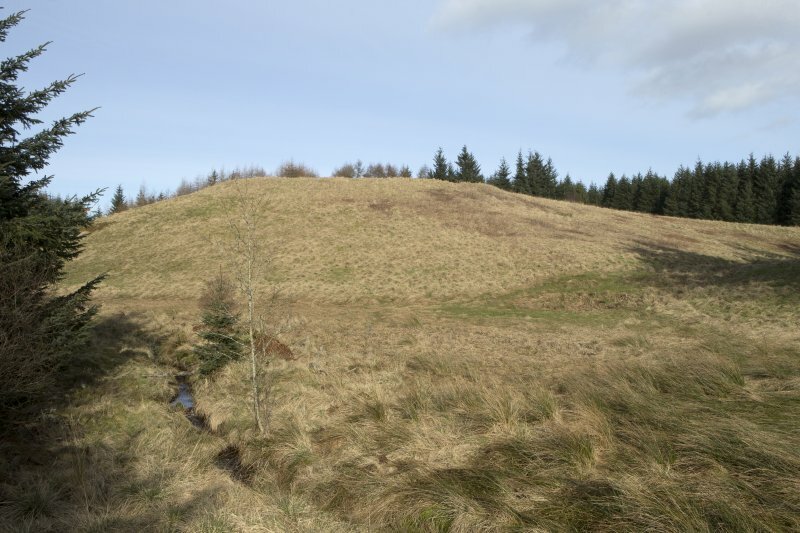 The NE scarp of the motte is 2.0m high, and 2.7m high on the SW. At the NE angle a fragment of walling is visible in the slope of the mound just below the crest. The interior is featureless. 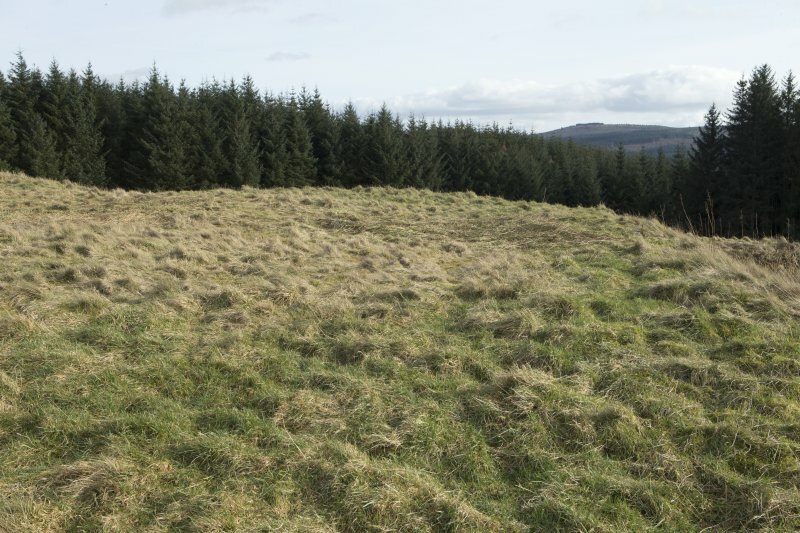 On the NE is a flat area, probably the bailey, though no ditch isolates it from the main ridge. 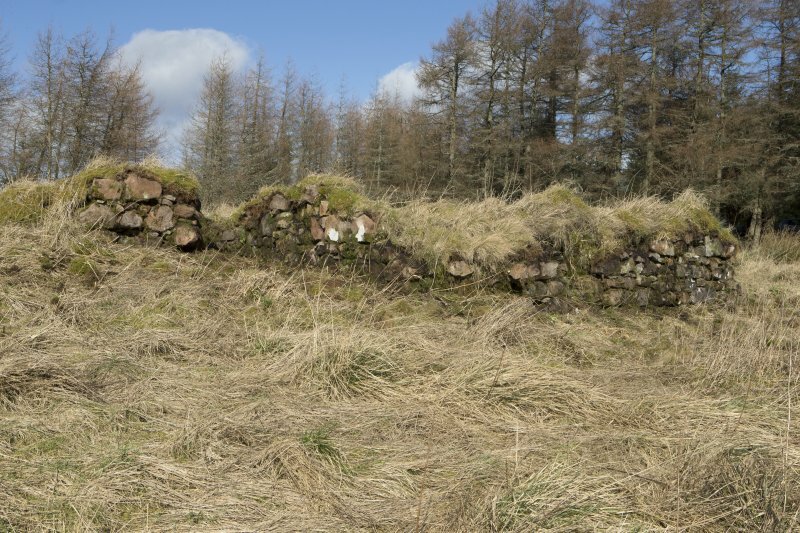 A stretch of rubble walling, 40.0m overall in length denotes the S side of some former buildings. Part of the easternmost building remain. 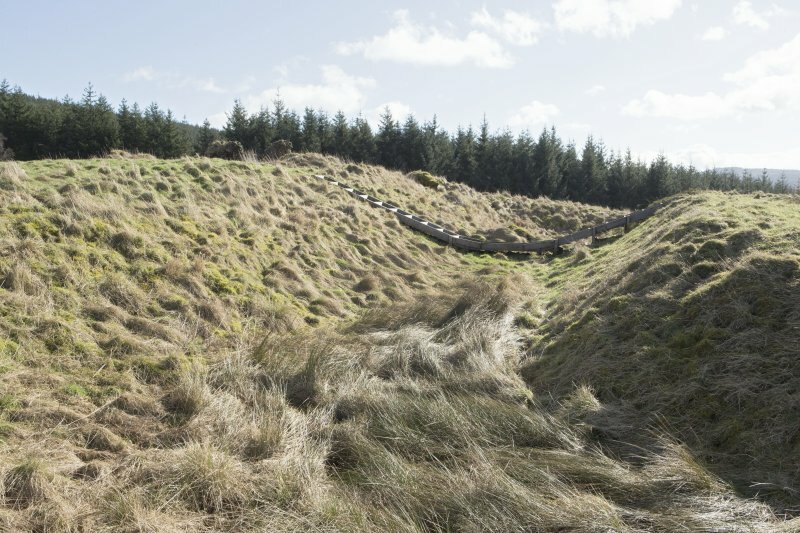 The S, and part of the W walls, remain at a height of 1.2m, and are 1.0m broad. 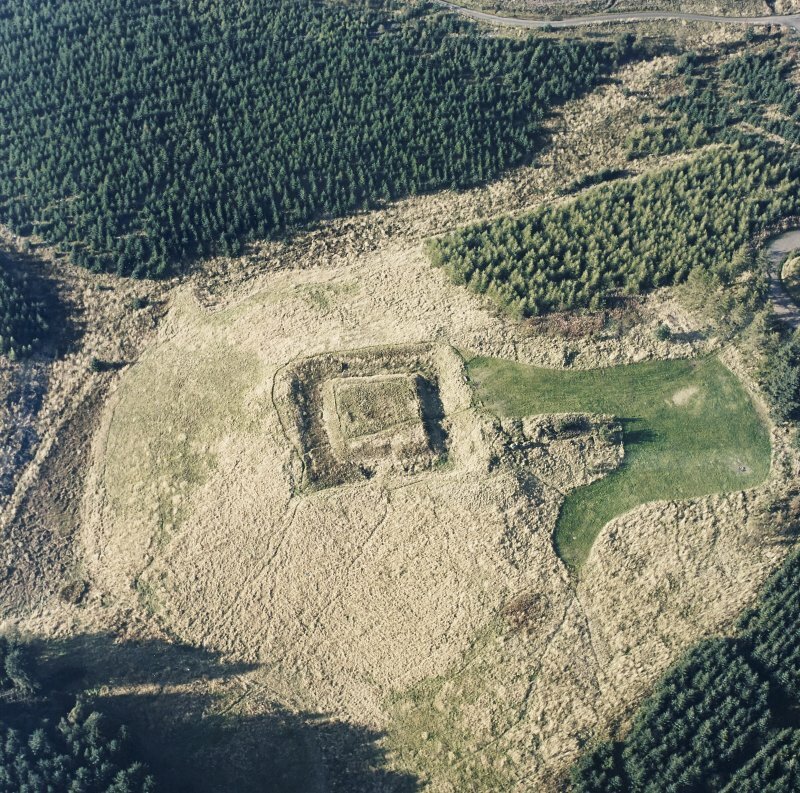 The N wall, and remainder of the W wall, is grass-covered, and only 0.2m high. 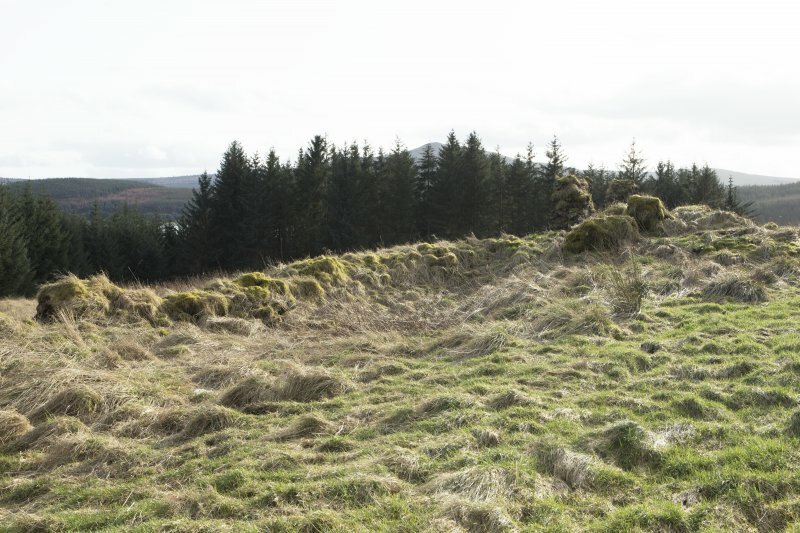 The westernmost stretch of wall is 3.0m high and 1.0m broad. 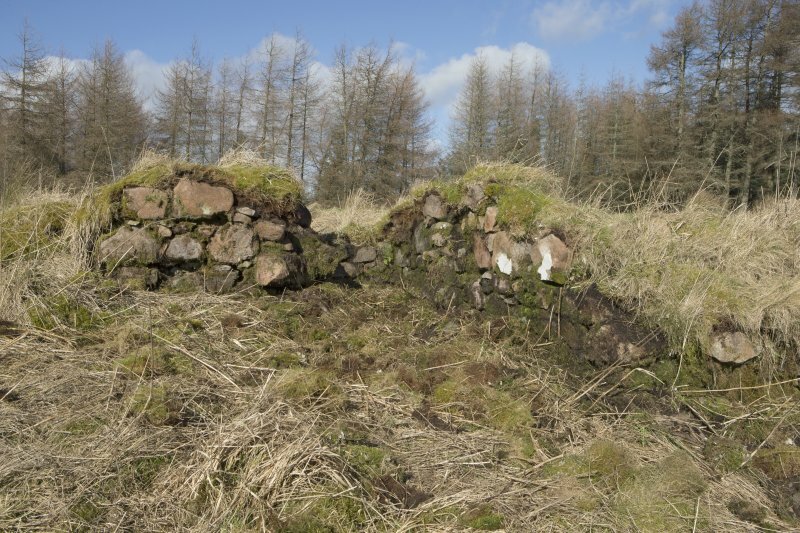 A few hollows on the N side of the wall denote where the buildings were situated. Many large blocks of masonry lie round about. 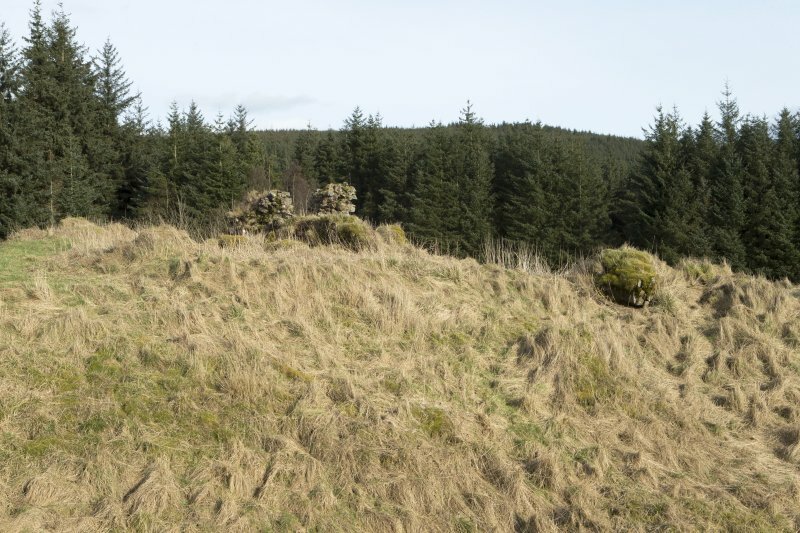 Vague earth-and-stone banks, 0.5m maximum height, situated on the NW side of the bailey, probably denote the sites of other buildings. 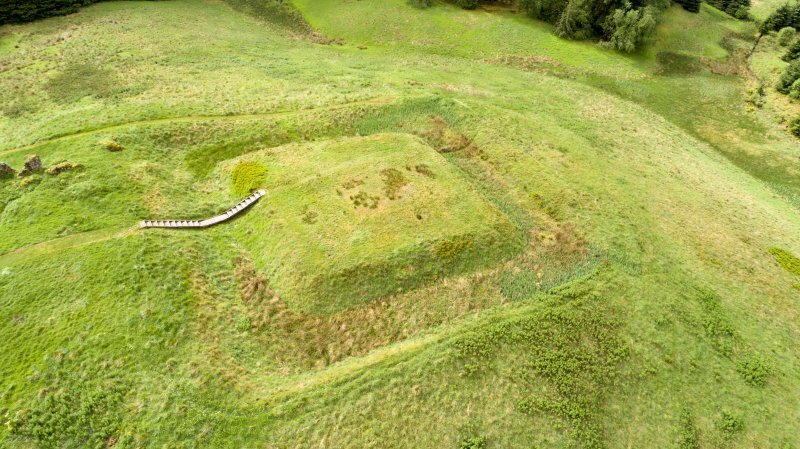 Except for the crumbling condition of the wall which remains, the motte is well-preserved. 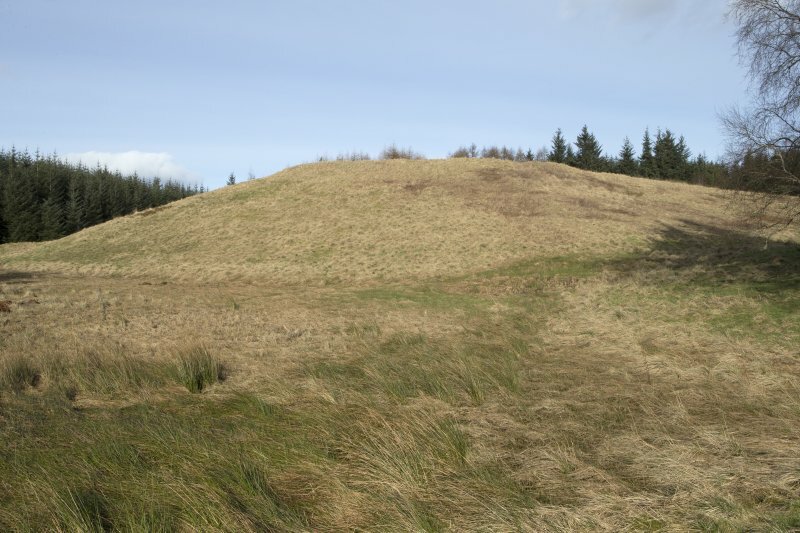 This motte is as described by previous authorities. 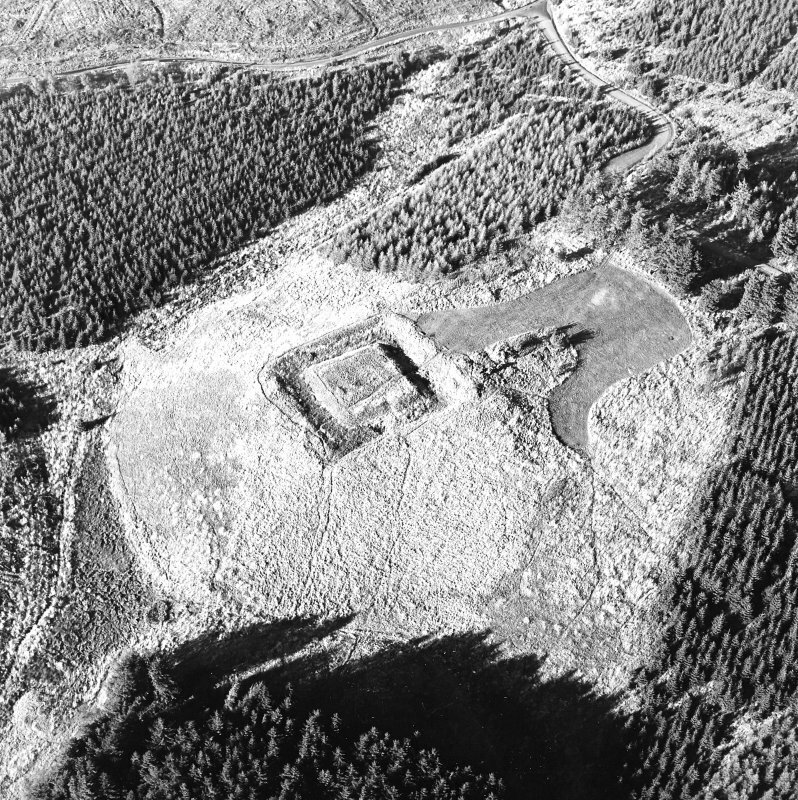 Visited by OS (SFS) 20 November 1975. NS 681 858. 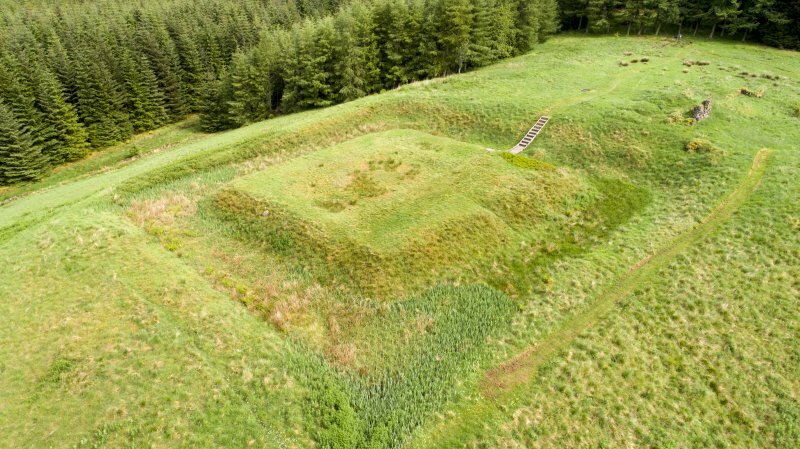 This motte is square on plan measuring 23m across. 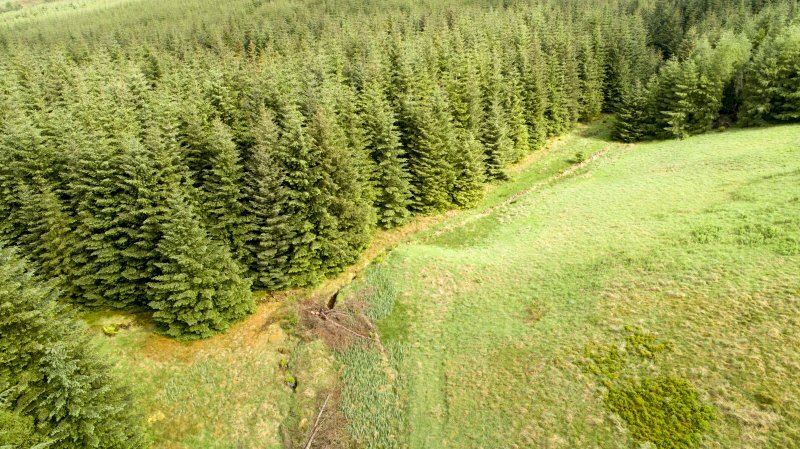 It stands to a height of 3m above the bottom of a surrounding ditch 9m wide. 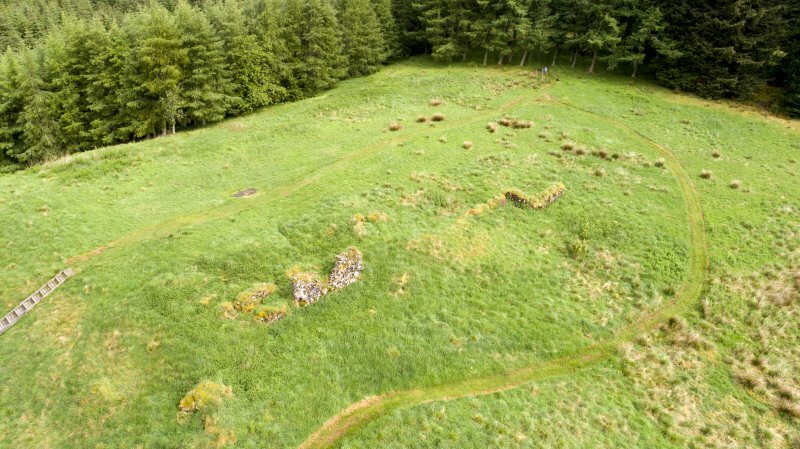 Fragmentary remains of stone buildings occupy the level ground immediately to the NE of the motte. 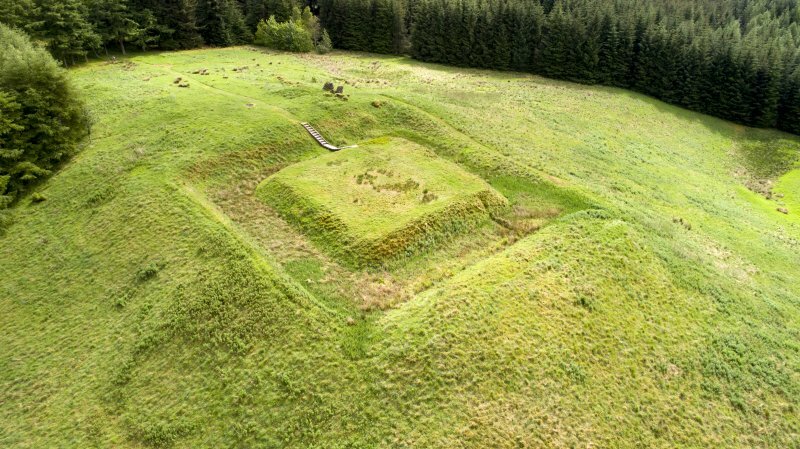 Sir John de Graham's Castle is a fine example of a relatively rare type of medieval earthwork-the square motte; moreover, instead of heaping up an artificial mound, a natural knoll was chosen and defended by a broad, flat-bottomed ditch, 11m across and 3m deep. 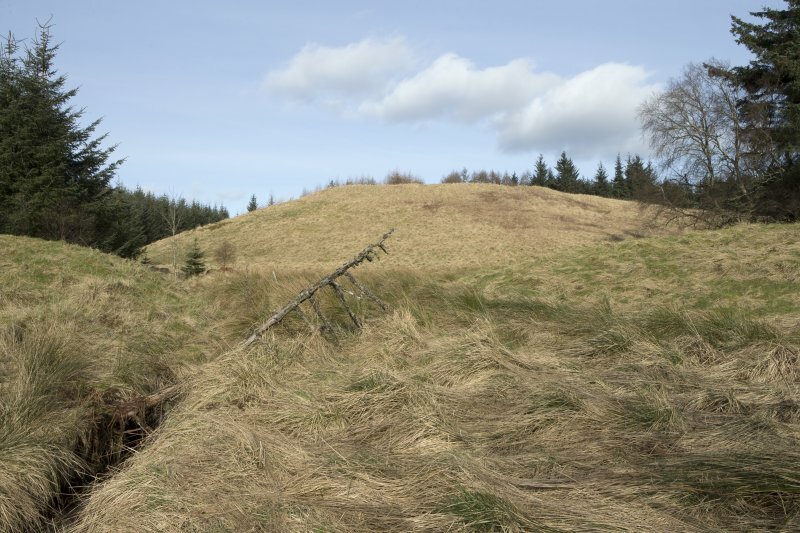 The ditch is continuous and access to the castle must have been via a wooden bridge which probably lay on the north-east side. The central platform is almost square and measures 22.8m by 23.4m. 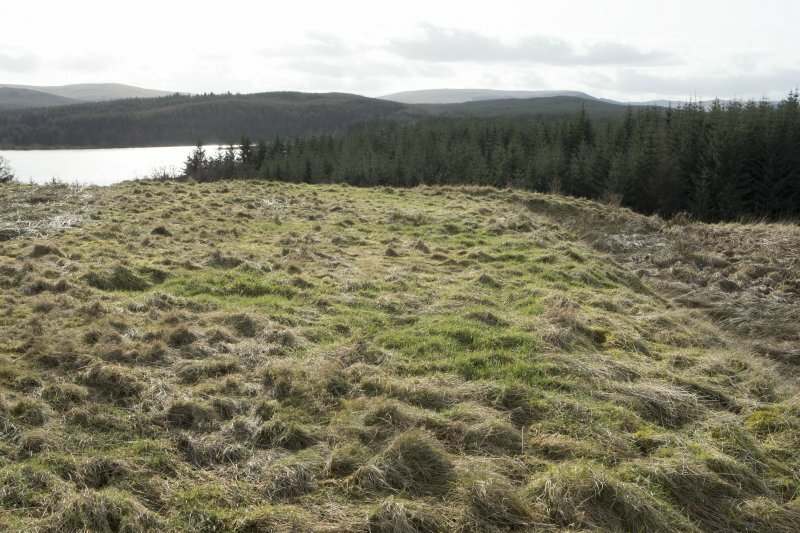 To the northeast of the ditch there are traces of a lime-mortared wall and fragments of banks which suggest the positions of ancilliary buildings. 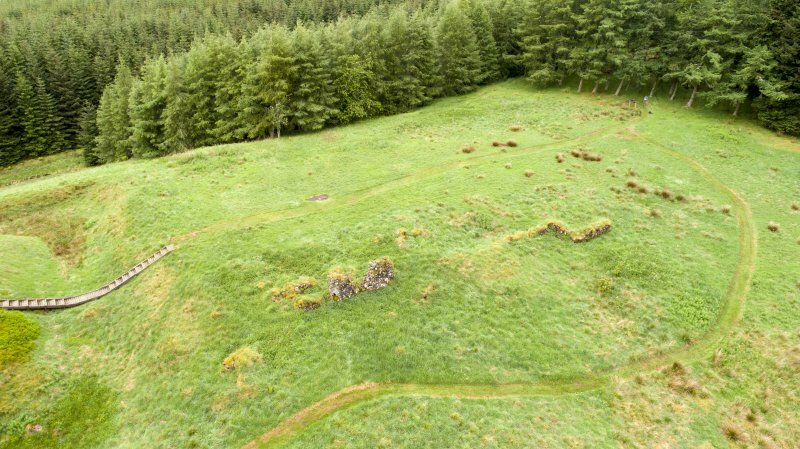 Traditionally, the site is thought to have been the residence of Sir John de Graham, who was killed at the battle of Falkirk in 1298, and whose memorial can be seen in the graveyard at Falkirk parish church (NS 887800). 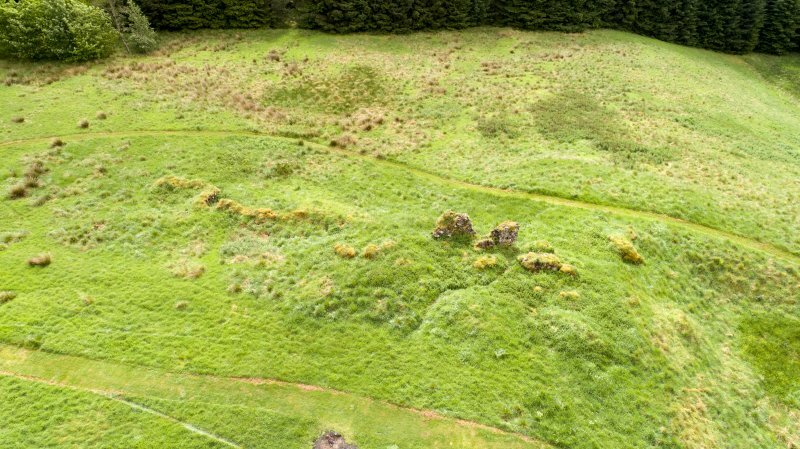 The castle, however, may be of earlier date, as it was probably the principal stronghold of the barony of Dundaff which is on record in 1237. This survey was carried out the spring of 2017 by HES' Survey and Recording Group as a Special Survey. 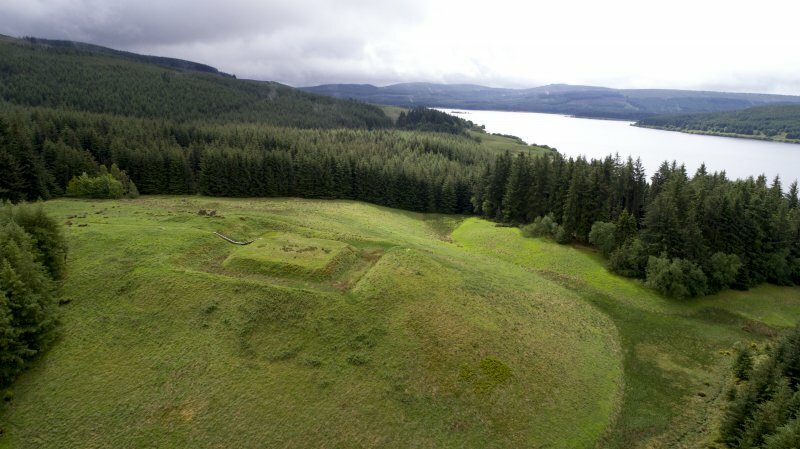 It was selected for survey because of the poor quality of the existing record, and has benefited from the Arts and Humanities Research Council Collaborative Doctoral Award to William Wyeth to study Early Stone Castles, 1050-1350, under the supervision of Professor Richard Oram of Stirling University and Dr Piers Dixon, HES. 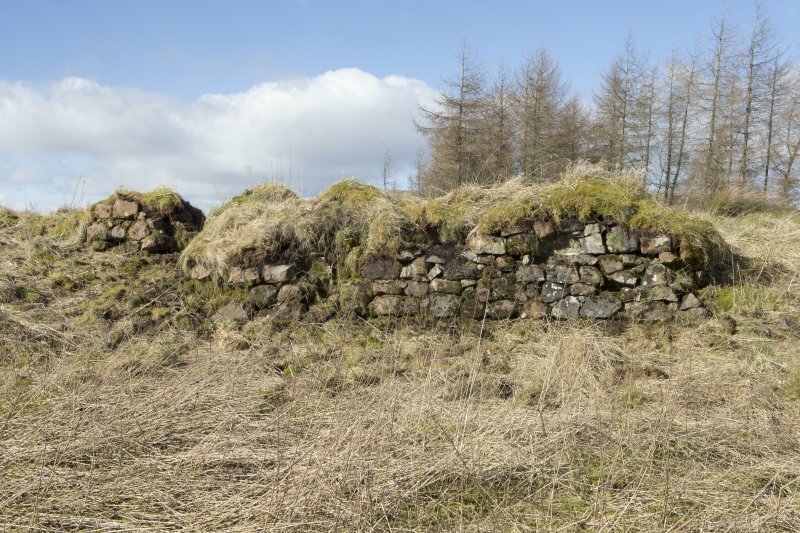 It was also HES’ contribution to a community heritage project led by Murray Cook of Stirling Council and funded by HLF that included environmental sampling of the fishponds. 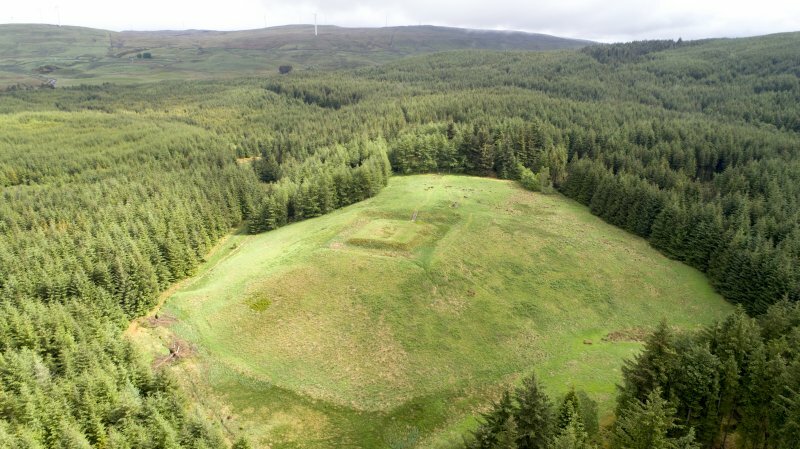 The survey team from HES included Heather Stoddart, Iain Anderson, Ali McCaig, George Geddes, William Wyeth and Steve Wallace. 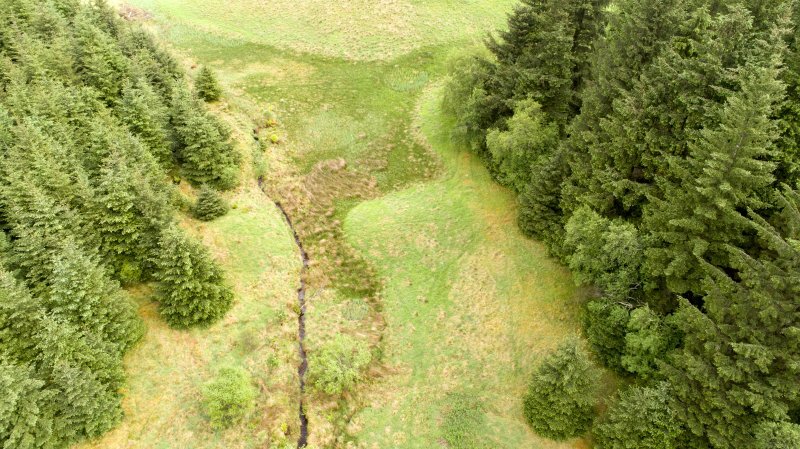 Forestry Commission Scotland provided Airborne Laser Scan data which was used to provide a base for the landscape survey at a scale of 1:1250. 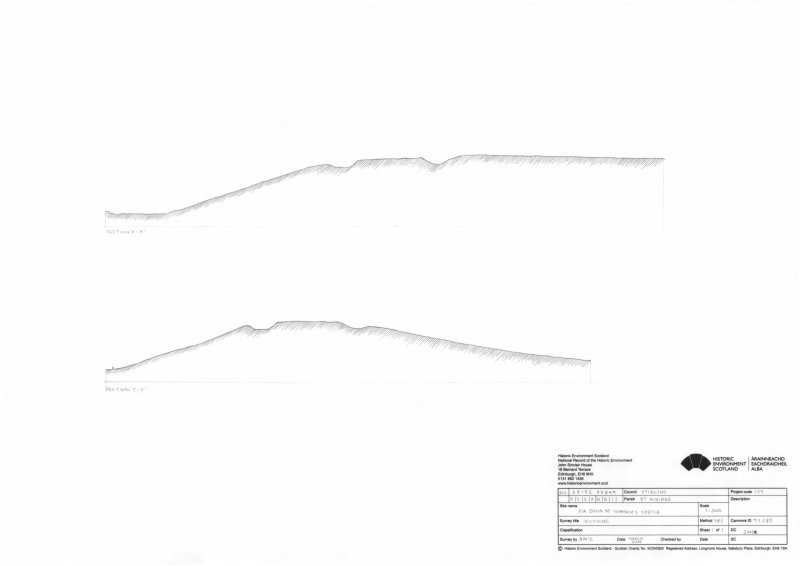 A detailed drawing of the buildings was compiled at 1:250 and low level aerial photography conducted with a UAV. 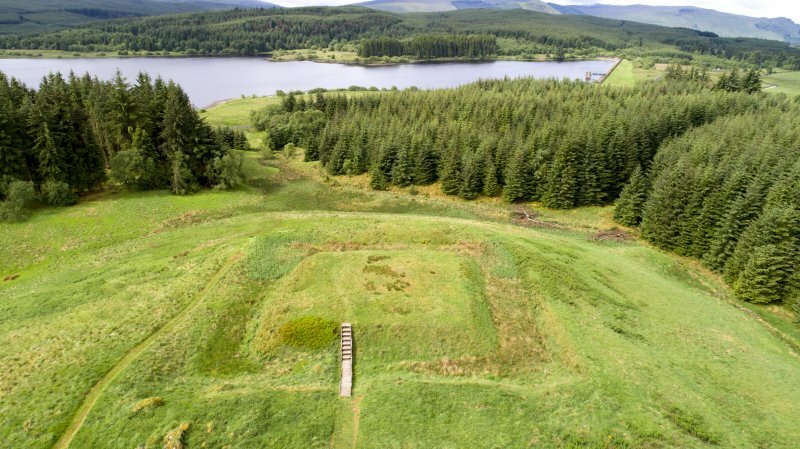 The castle occupies the end of a ridge overlooking the Carron reservoir, once the watershed between the Carron and the Endrick Water. 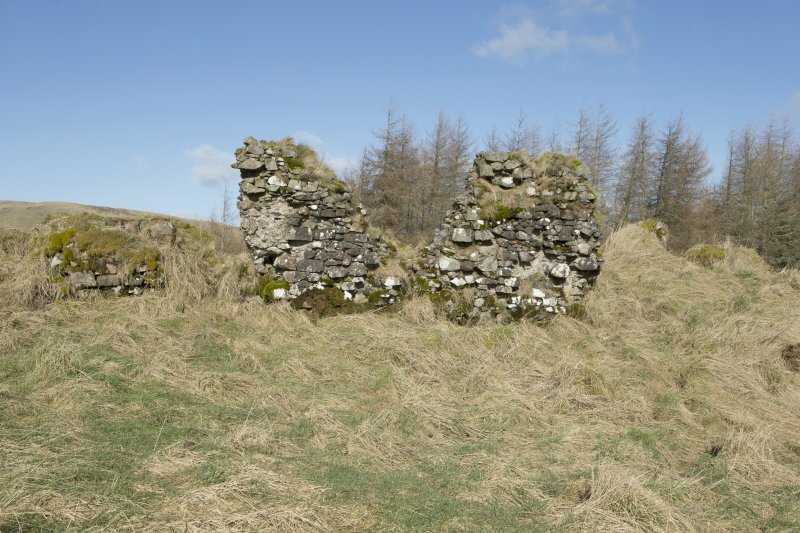 The castle dominated the route through from the royal hunting forest of the Forth valley to Fintry in Lennox. 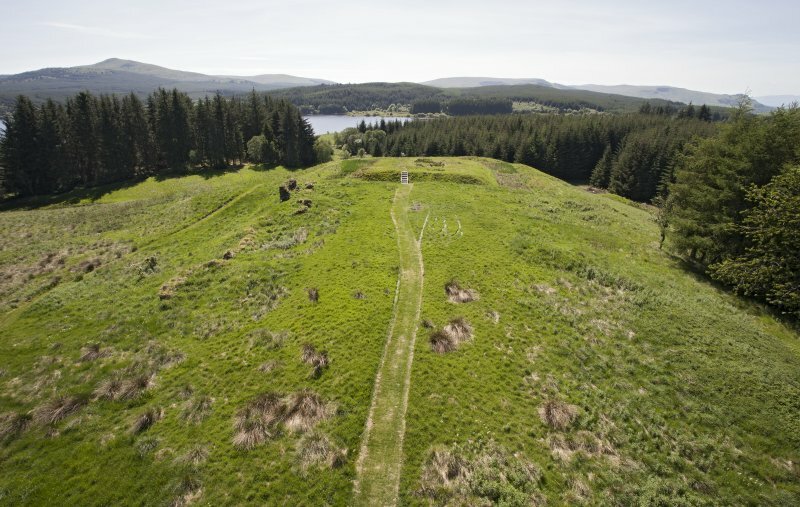 Around the foot of the castle there are the remains of a system of water management with two dams with openings for sluices. In addition, a gully to the south of the castle has a long narrow fishpond, which may have been a spawning pool for the larger ponds. 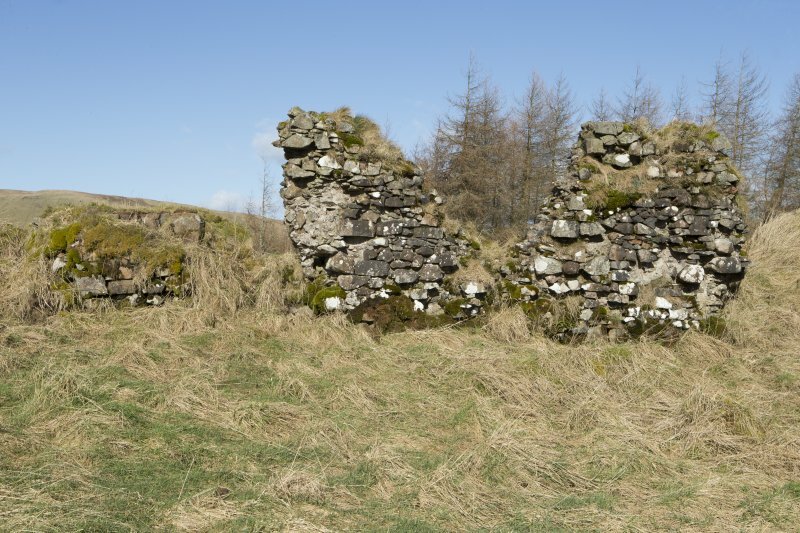 The Statistical Account of Scotland (from 1791-99) contains an entry describing the site by the Reverend Sheriff: “the ruins found in the muirland, near the source of the Carron, should, with some others in the parish, have been passed over in silence, were they not generally supposed to be the remains of a castle, the residence of Sir John the Graham, who fell in the battle of Falkirk [in 1298], defending the liberty of his country against the ambition of Edward” (Vol. 18 Parish of St Ninians). 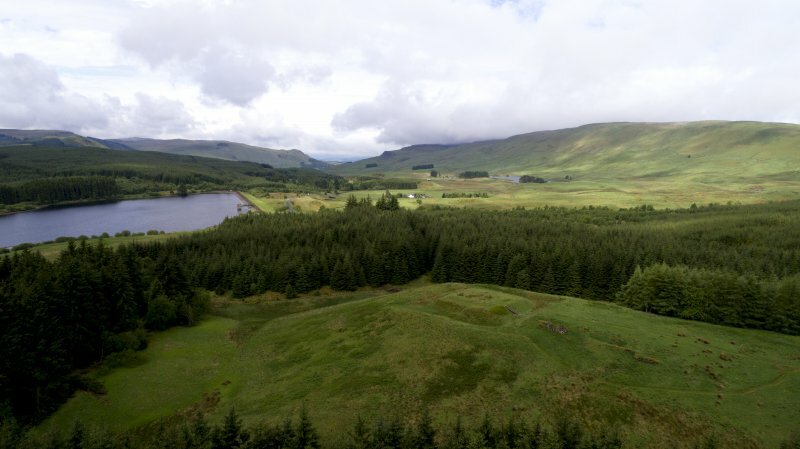 Sir John de Graham is one of William Wallace’s principal supporters in Blind Harry’s famous poem ‘The Actes and Deidis of the Illustre and Vallyeant Campioun Schir William Wallace’ (also known as ‘The Wallace’), written around 1477. 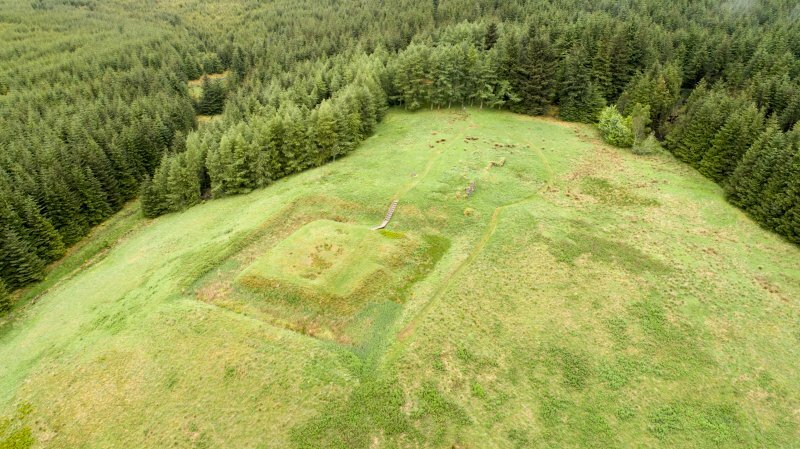 For an archaeological site of this nature to be so ‘generally supposed’ to be associated with a significant historical figure is unusual – and this has served to elevate the site above others normally ‘passed over in silence’. But what is the actual evidence linking this site to Sir John de Graham? A Tale too Good to be True? 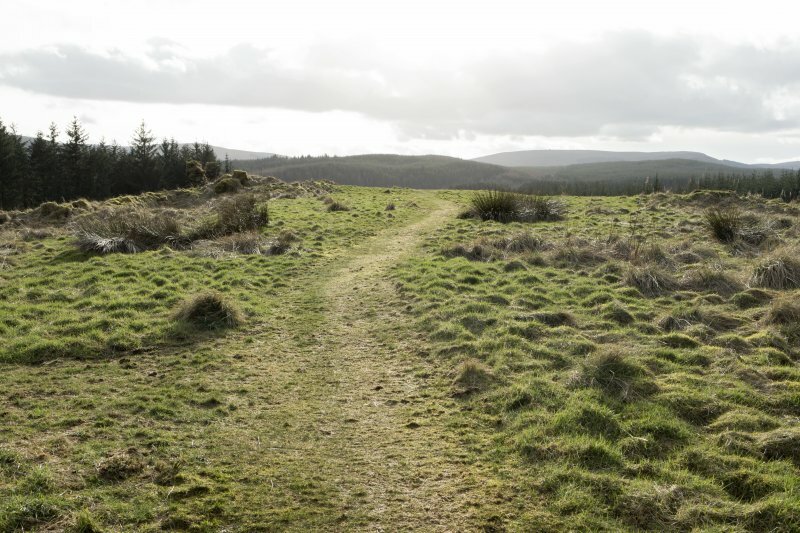 A 13th century charter records ‘the whole waste lands of Dundaff and Strathcarron, which was the King’s forest’ being granted by Alexander II to John’s father, Sir David de Graham, ‘for his homage and service’ (and in exchange for land in Galloway). 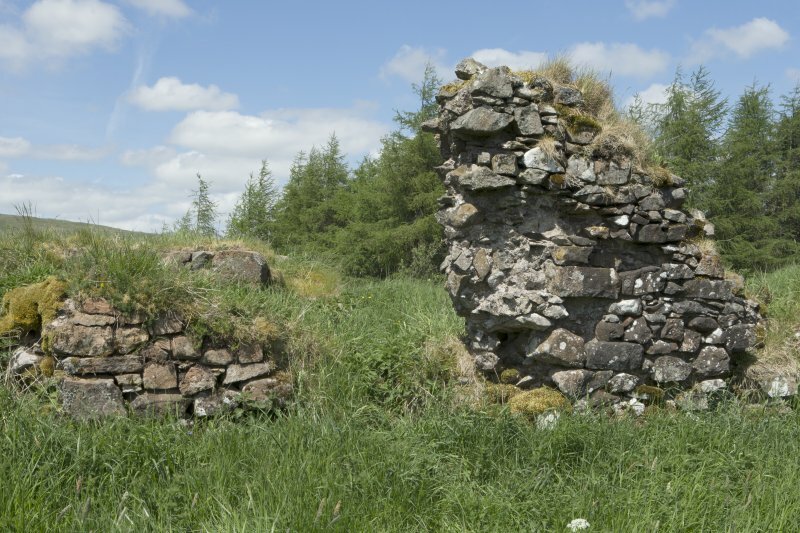 So the castle itself may be of earlier date, having been built as the principal stronghold of the Barony of Dundaff. 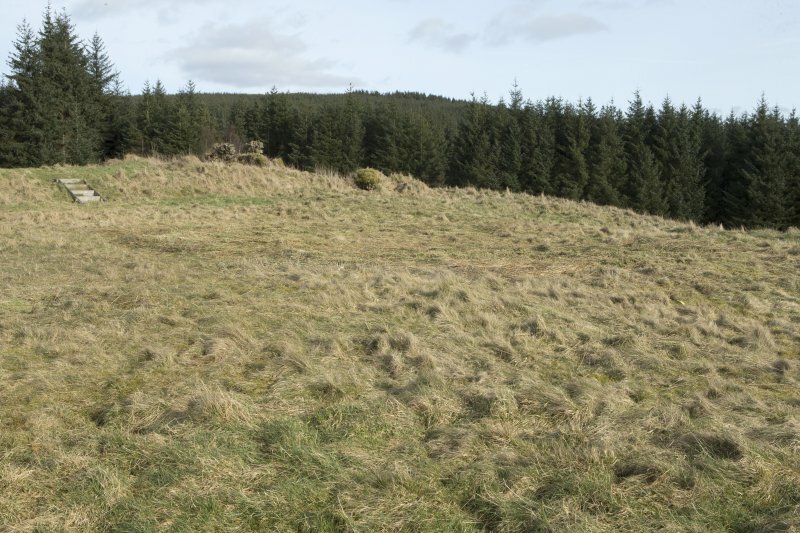 That a John de Graham was the third son of Sir David de Graham is not in doubt – but was this the same John immortalised in ‘The Wallace’ as having fallen at the Battle of Falkirk, or perhaps a son or relative? Thought it convenient for him now to fly. 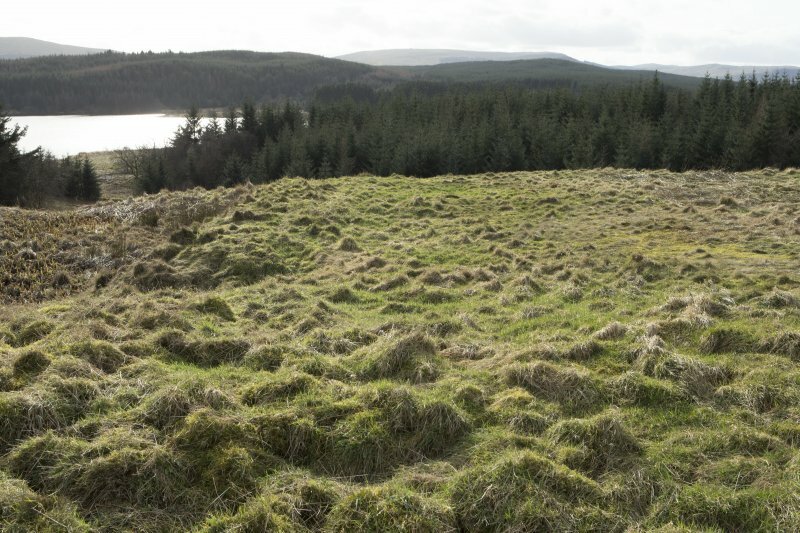 Although Blind Harry’s poem was written long after the event, it does clearly link his Sir John de Graham to the area; and although the earthwork was likely built some years beforehand, it does mark the feudal estate of Dundaff, property of the de Graham family. 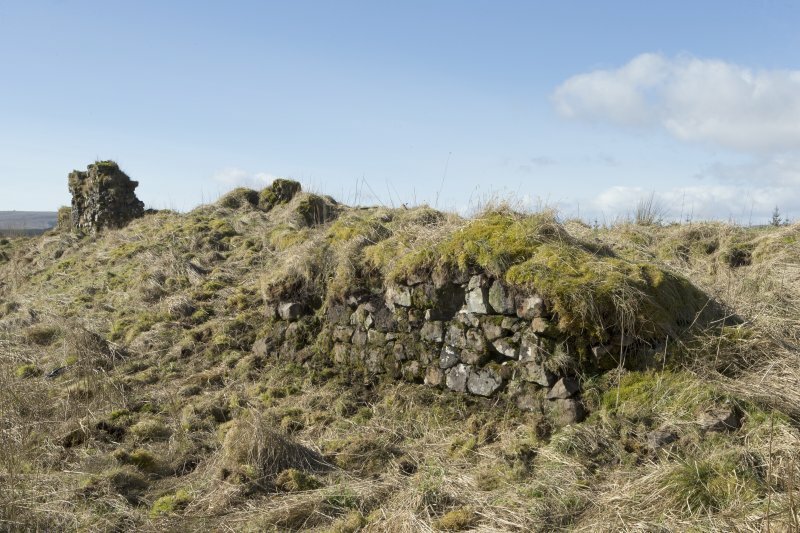 Fact and fiction do seem to meet at Sir John de Graham’s castle to tell a story of place that is firmly rooted in the past. 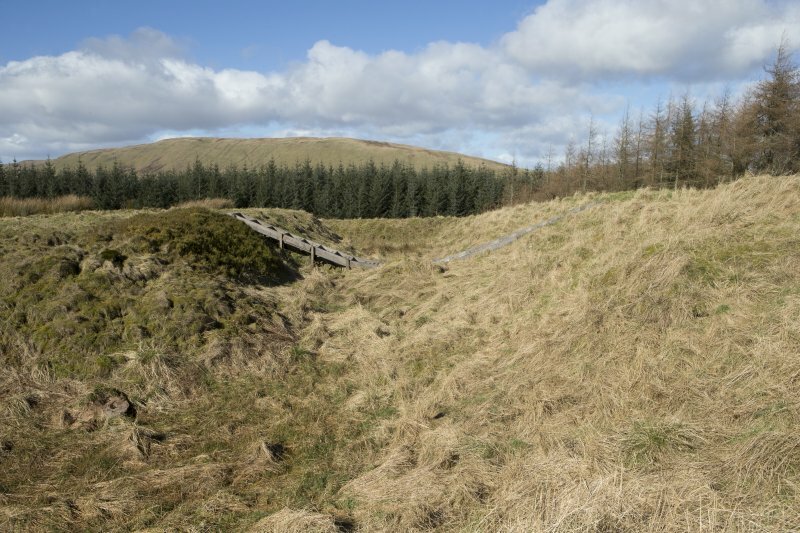 This castle, which was previously classified as a motte and bailey, dominates the watershed between the valleys of the Carron and Endrick rivers and is situated on the SW end of a natural ridge above a boggy gully in which runs a small burn. 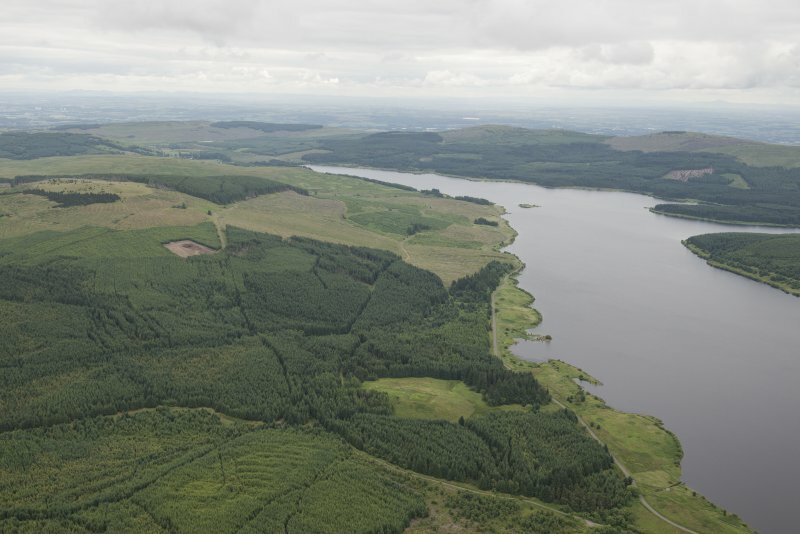 Manmade ponds are arranged around the W and S of the ridge and straight rig and furrow is visible on the SE. 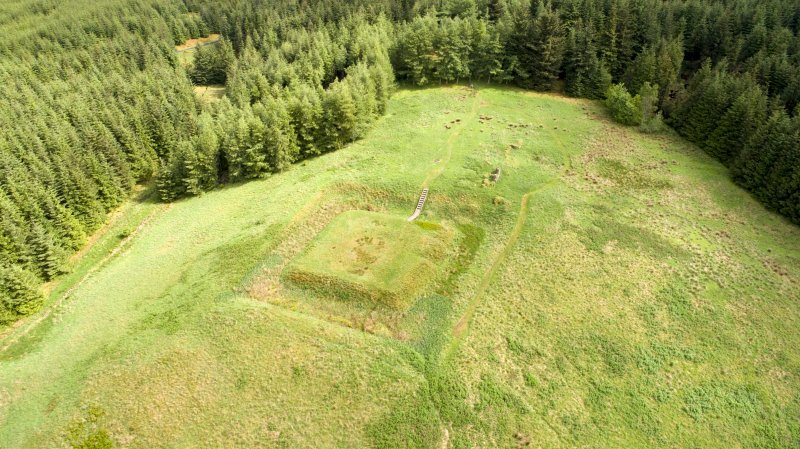 The castle now lies within a clearing of a Forestry Commission plantation; it comprises a slightly off-square moated enclosure and two ranges of buildings to either side of a yard immediately to the NE. 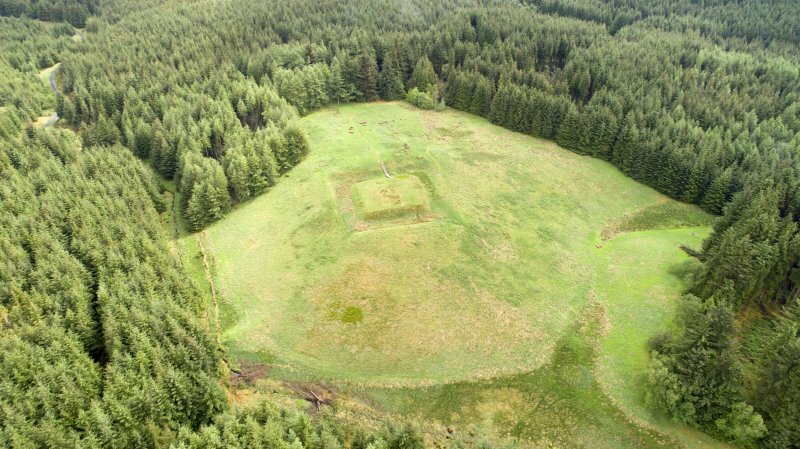 The enclosure measures 23m square within a moat 11.5m in breadth and up to 2m deep. 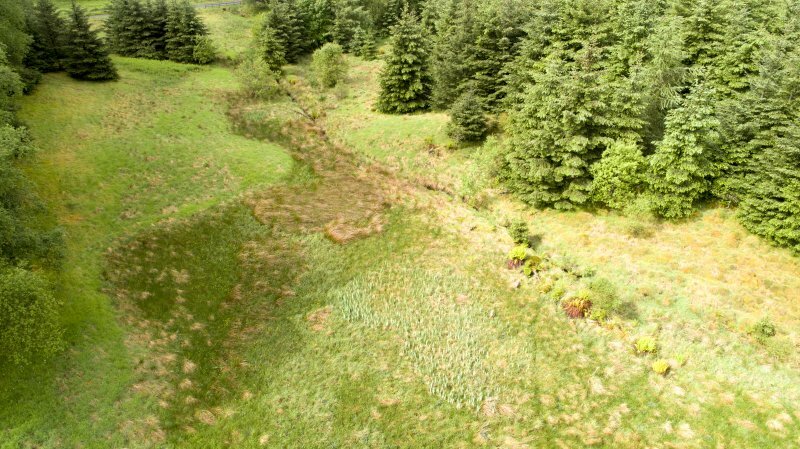 The moat stills holds water at the SW side and a gap at its S corner may have held a sluice gate used to manage the water level. 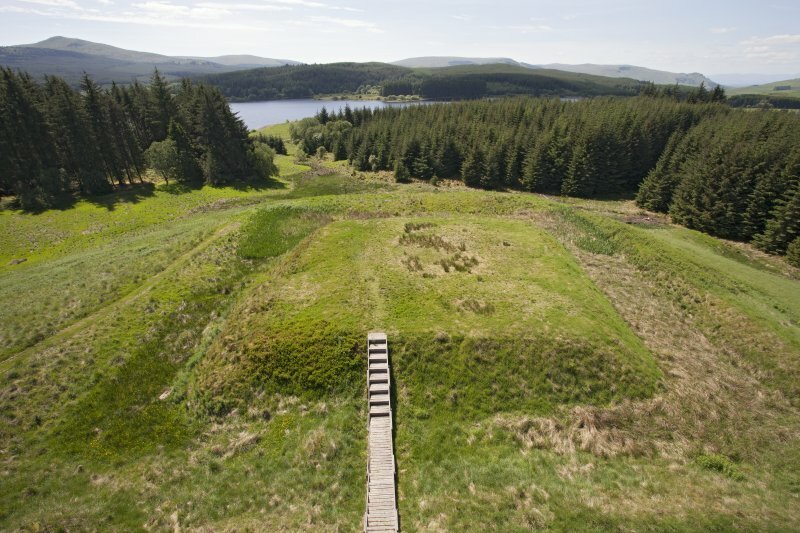 Up-cast from the moat is heaped along its outer edge and has been formed into a wide level platform along the SE side. Access across the moat was via a drawbridge that was supported by an abutment which survives as a terrace about 3m in length visible in the side of the moat on the NE. 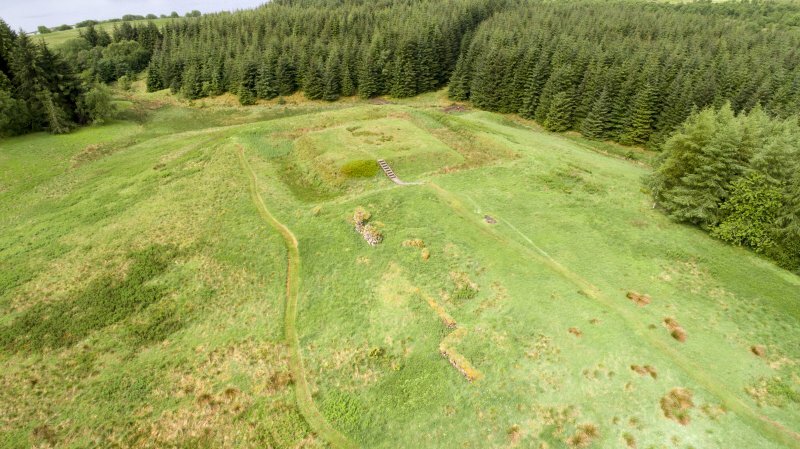 The enclosure was occupied by four ranges of buildings around a central square c 8m across. Each building is defined by a low flat-topped bank c 1.5m in thickness and standing up to 0.35m in height, suggesting a timber-framed superstructure based on stone footings. 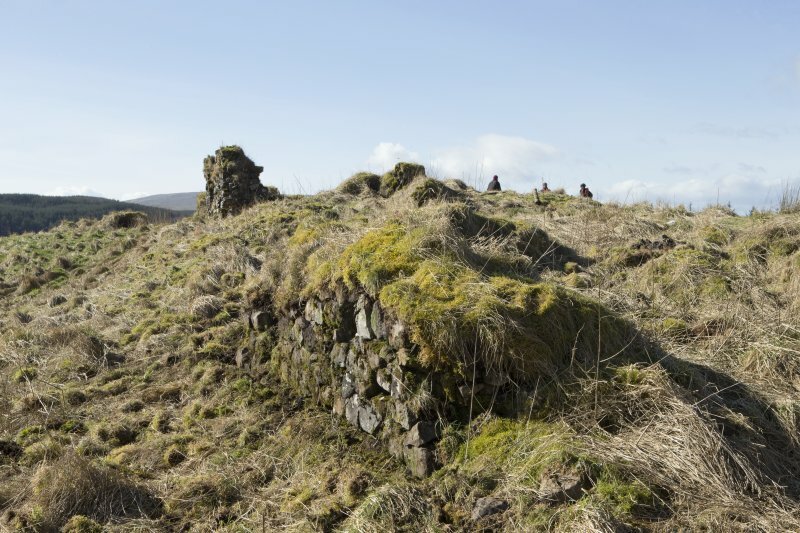 Those on the NE and SE are more prominent and the external walls on the NW have been lost to erosion. Each range appears to have been sub-divided with a square compartment at each corner and a larger central room. 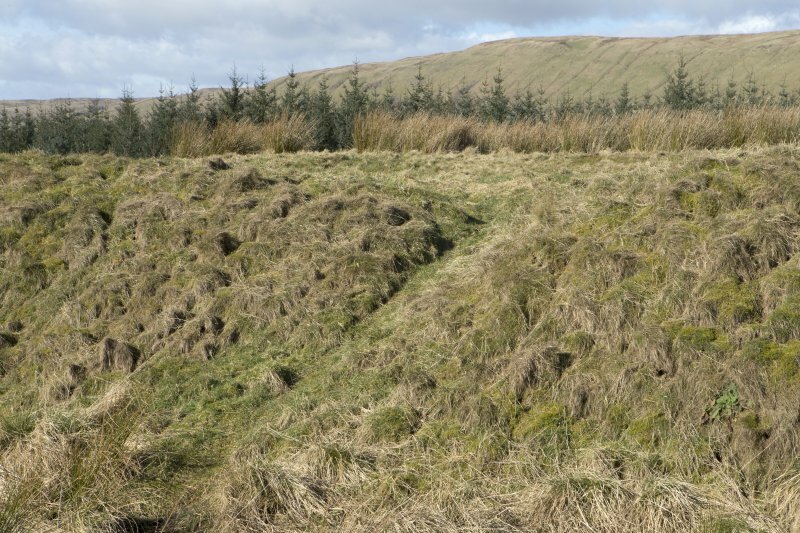 A gully cuts through the outer wall of that on the SE side, suggesting the possibility of a slops-drain from a kitchen or perhaps a garderobe. Another drain visible as a gap in the walls was noted at the W corner. 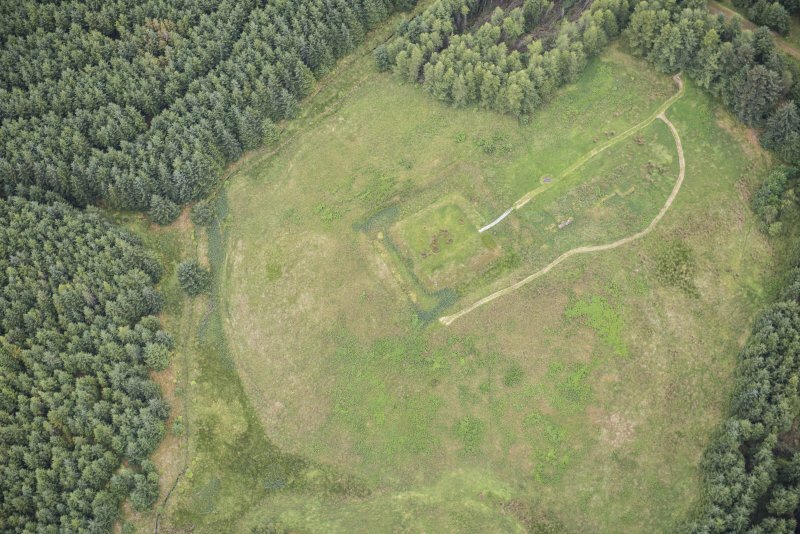 To the NE of the moated enclosure there are the remains of two parallel ranges set to the NW and SE of an open yard. 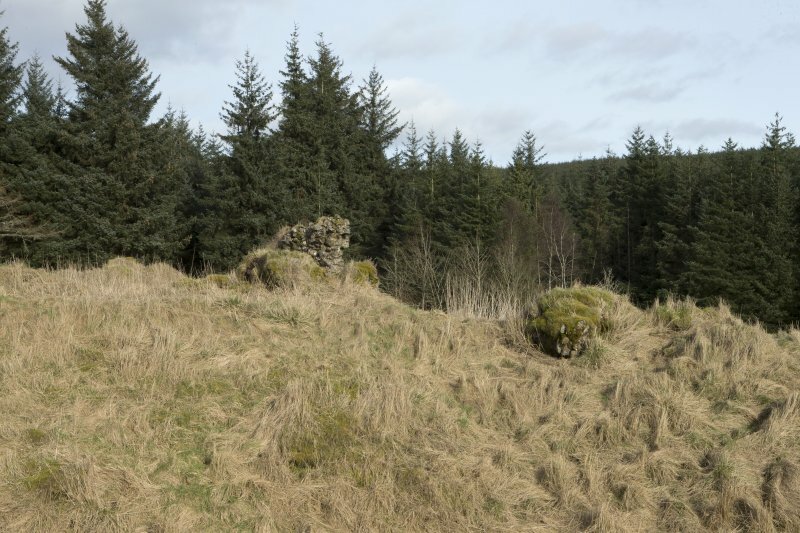 Given the absence of stonework the NW range may have been timber, although its NE end is obscured by debris from stone-robbing, with piles of small stones. The NW range comprises two separate buildings, 12m apart. That to the SW measures about 16m by 8m overall. 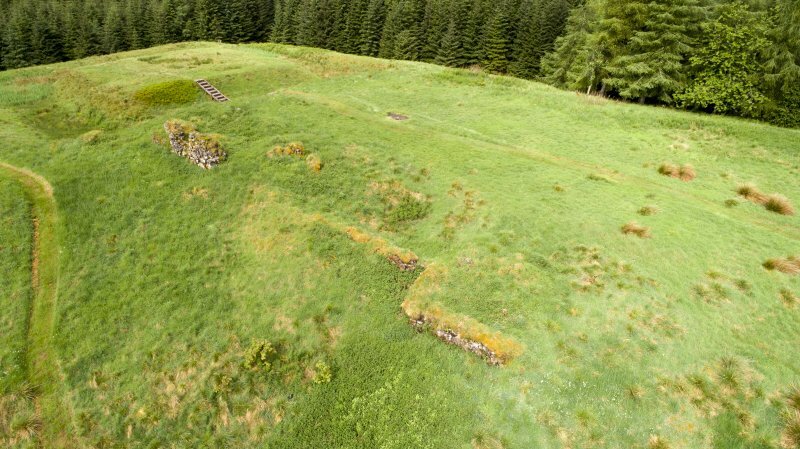 Alongside the building there appears to have been a passage, marked by a slightly raised flat area, c 2m wide, leading to the bridge over to the enclosure. 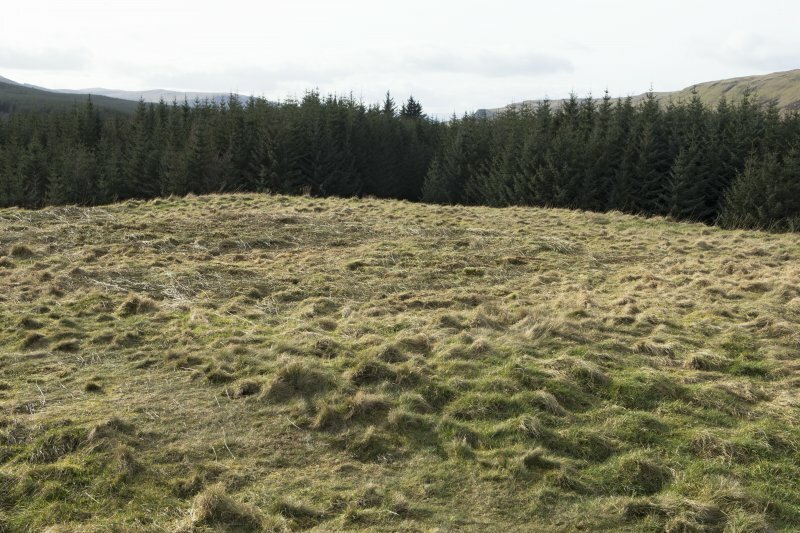 This may also mark the back of another building platform between the passage and the SE building range, c 9m across with a broad bank on the NE. 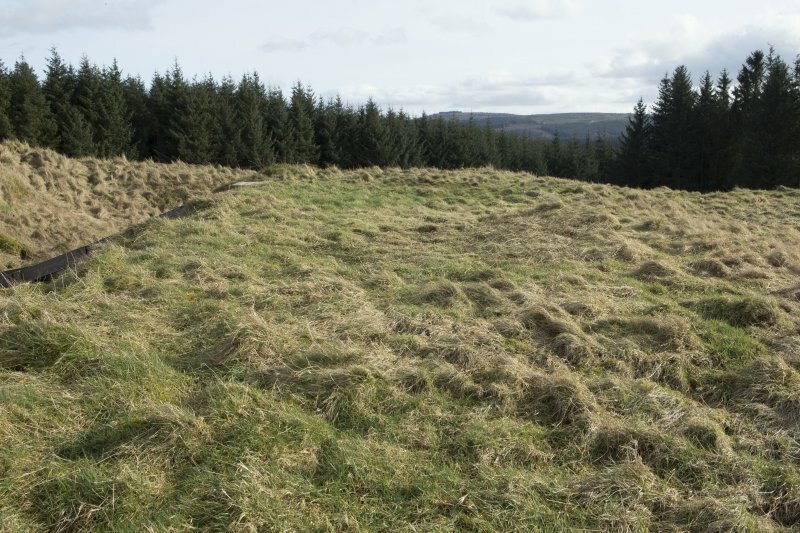 The second building of the NW range, 12m to the NE, is marked by a hollow 14m in length, which is partly overlain by the piles of stone debris. 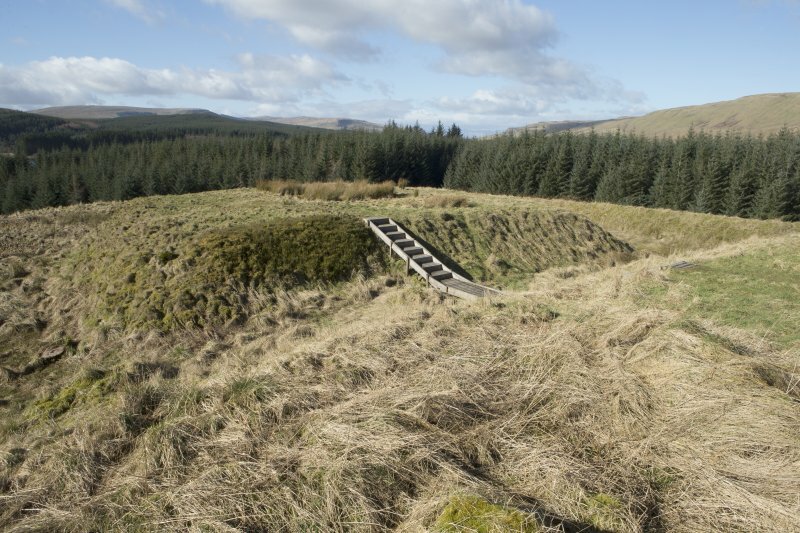 A low terrace runs in an arc SE from this hollow for about 15m before returning to meet the corner of the stone range on the SE. 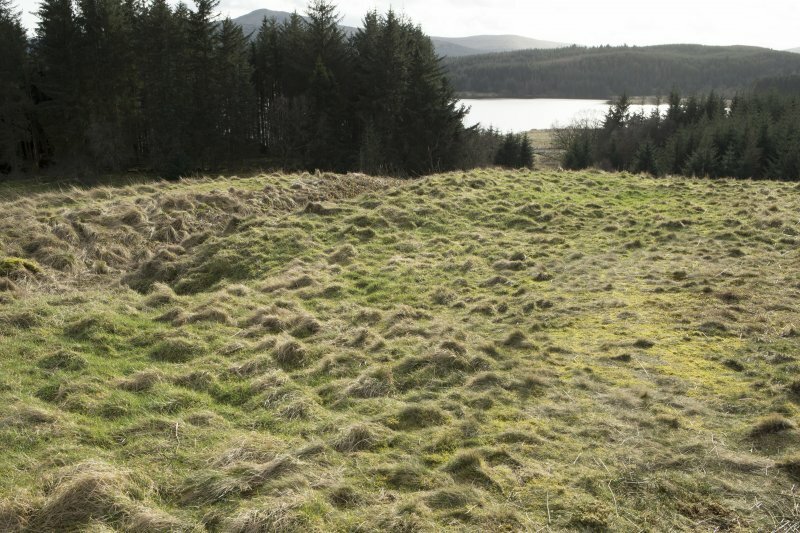 A possible entrance is suggested by a flattening of the edge of the terrace in the middle of the NE arc. 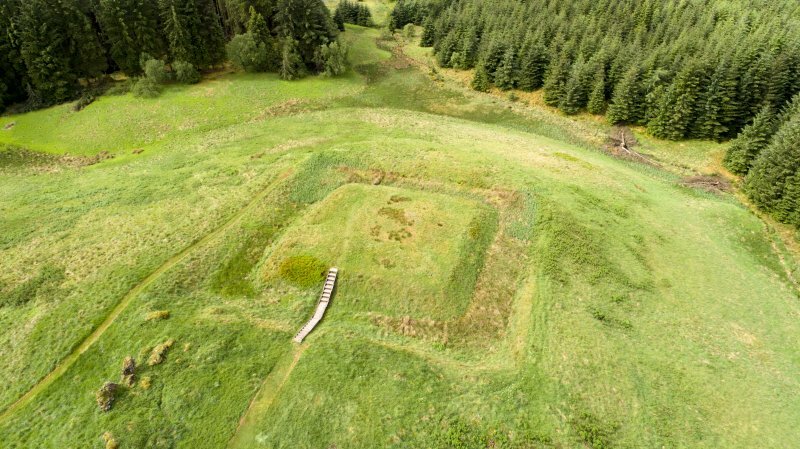 The SE range is stone-built and has been all but demolished except on the SE side, where a ruinous wall stands up to about 2m in height. The overall size of the range extends to about 33m in length by 8.5 in breadth overall and comprises two unequal compartments with a turret on the E corner, 7m across, that is offset 2m to the SE. 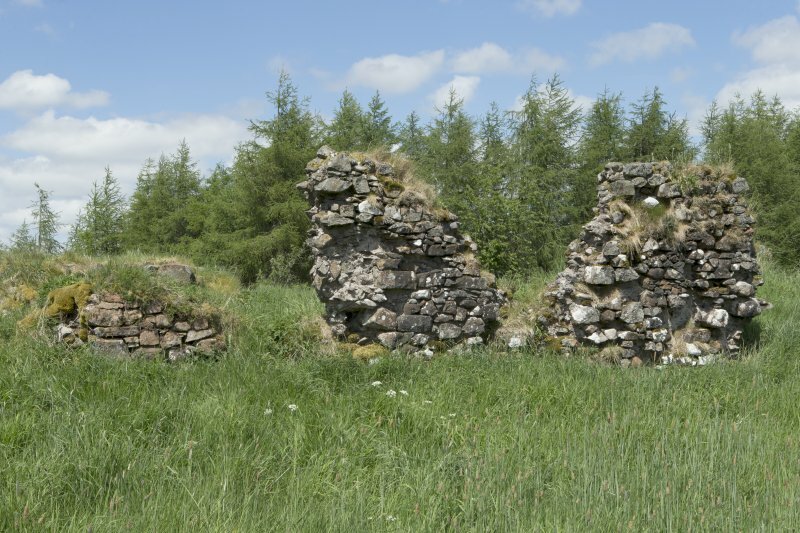 The NE and larger of the two compartments has an undercroft or basement which is partly filled with stone rubble and collapsed masonry. The base of a garderobe chute occupies the corner of this compartment and return of the turret on the E corner, indicating that there was an upper floor. The SW compartment has a gap in the wall that may be the location of a slops drain in the middle of the SE wall. Some of the masonry has collapsed into the edge of the moat. 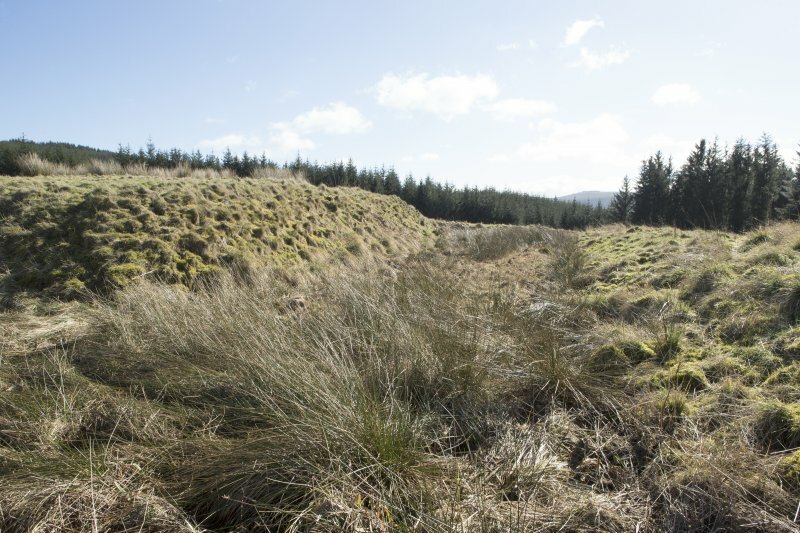 The small burn that flows past the site on the W cuts through the middle of two large earthen dams, each about 2.5m in height and 10m in breadth, and the one to the N is set 2.6m higher than the other. 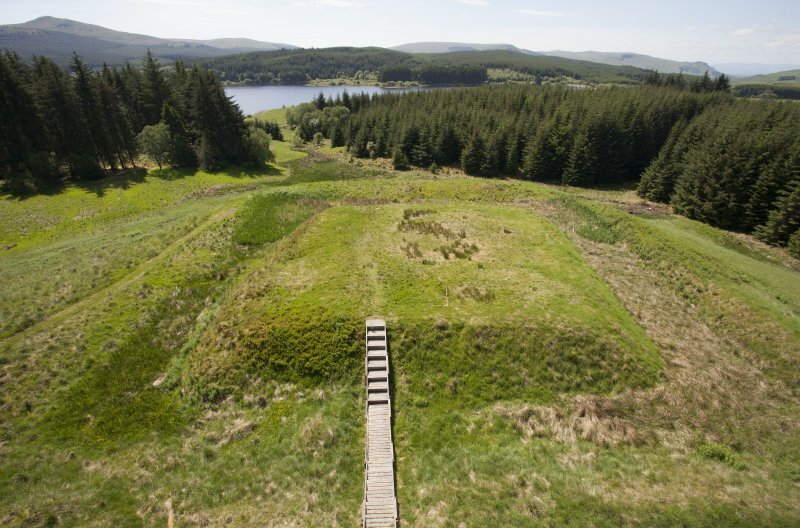 The wide gaps through each dam presumably mark the location of sluice gates used to manage the water level within each pond, and the NE edge of the lower pond is clearly marked by a steep scarp with a terrace behind. 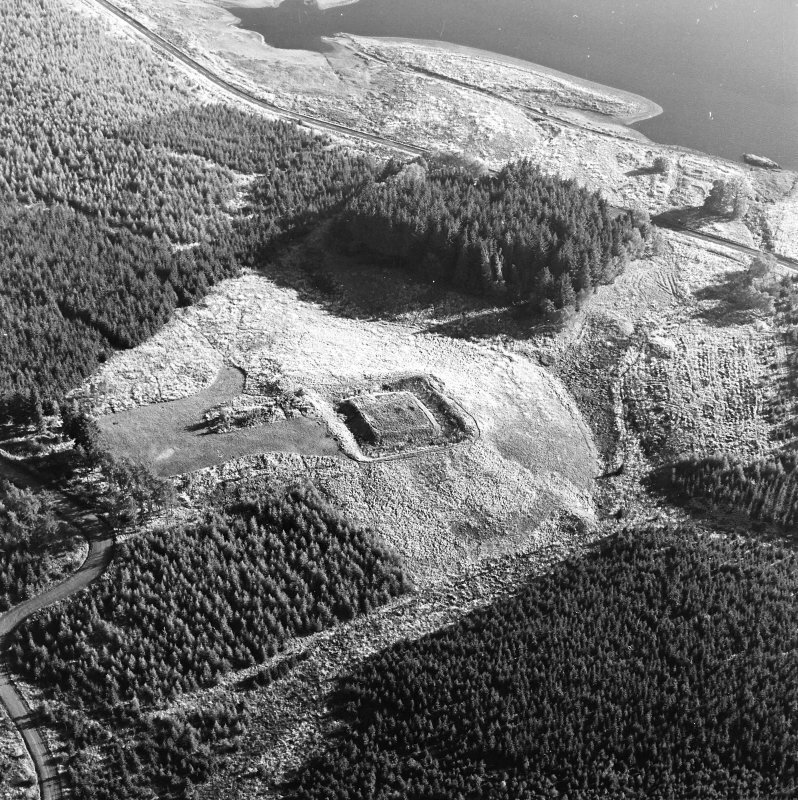 Quarry hollows are visible at the location of each dam, and were presumably the source of the material for their construction. 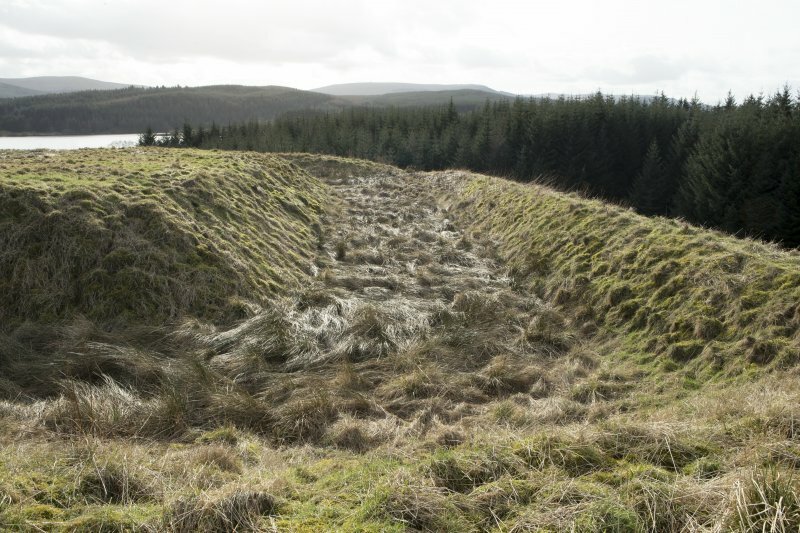 A drystone dyke that runs through the gap in the upper dam is post-medieval in date. 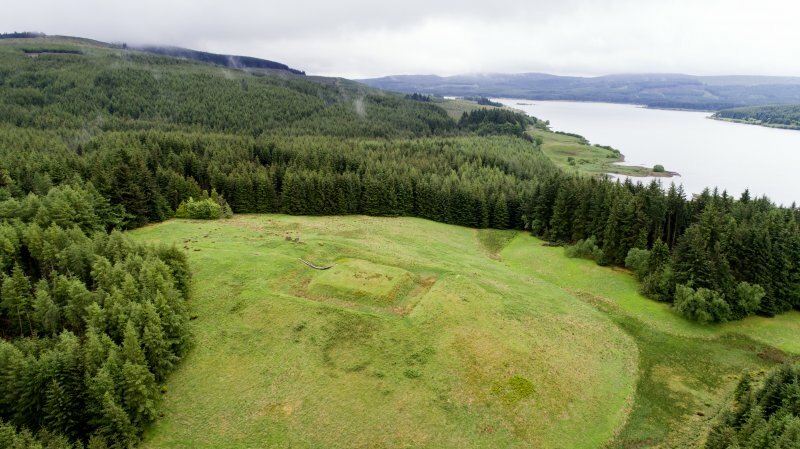 To the S of the castle ridge there is a long narrow trench which measures about 45m from WNW to ESE by 6m in breadth overall and 0.5m deep, interpreted here as a fishpond which can be compared with the example at St. Serf’s Priory in Loch Leven (Canmore id 27872). The lack of any sign of water in this pond may be due to changes in the water-table. 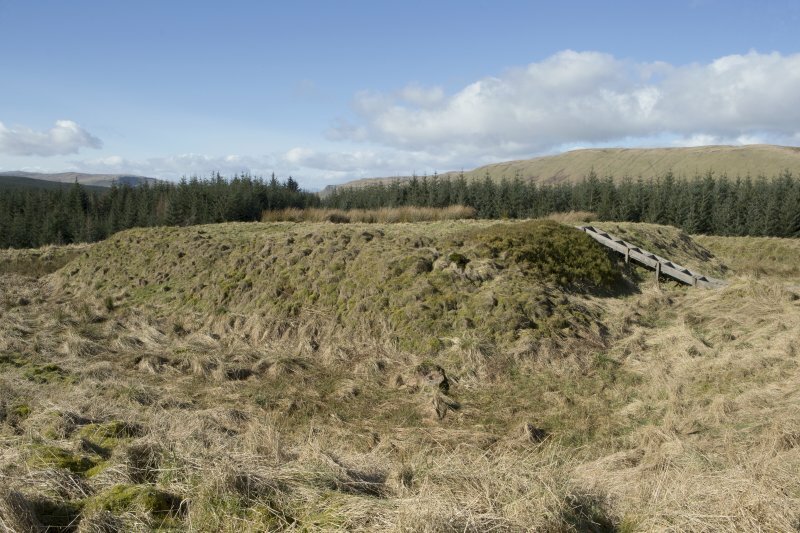 There was a boggy flush at its W end which may be where there is a spring that once fed the pond. 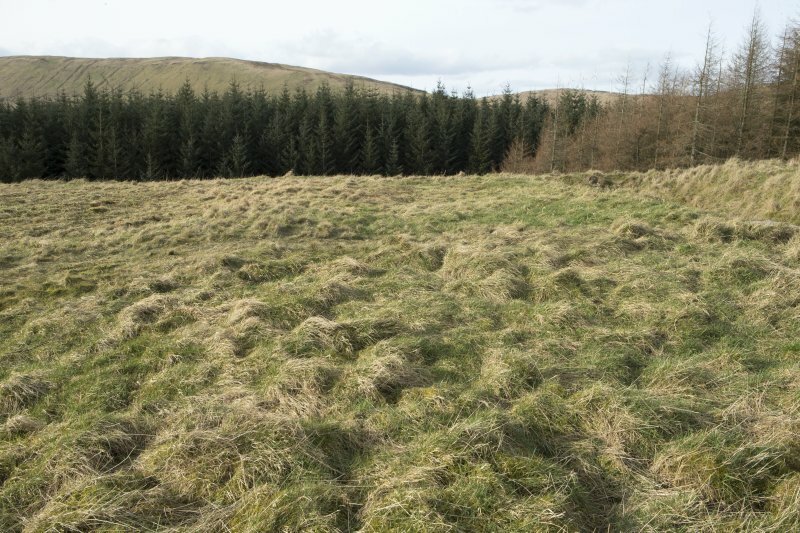 A further boggy area c25m to the E also has a terraced edge along its SW side, suggesting another manmade pond. 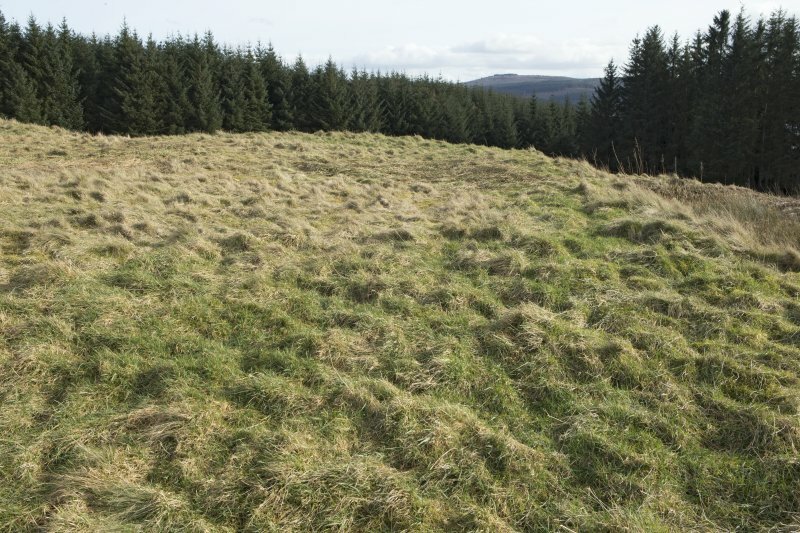 The straight ridge and furrow is very slight and difficult to detect except on the level ground at the NE end of the castle enclosure where the grass is cut short, but Airborne Laser Scan data provided by Forestry Commission Scotland revealed that it extended down to the edge of the narrow fishpond on the S. It measures c 4.5m from furrow to furrow and is aligned from NE to SW. It represents a cultivation episode coeval with improved farm of Smallburn, some 250m to the SW (Canmore id 357114). 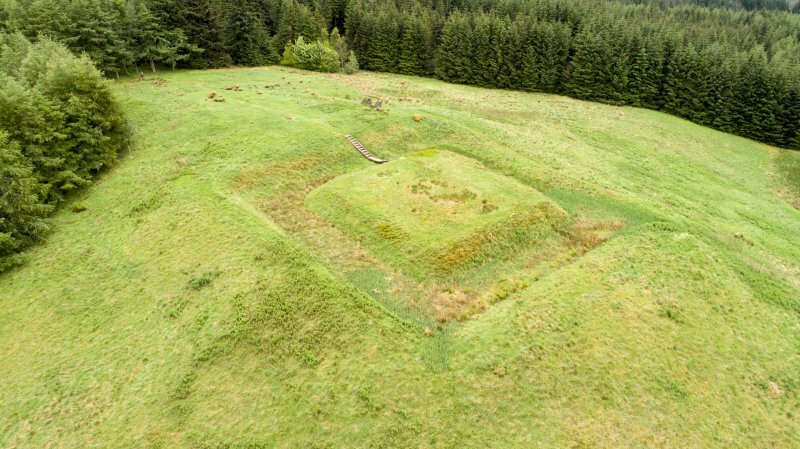 A community project, involving volunteers and pupils from local Primary Schools, was carried out at the sites of Sir John de Graham’s Castle and Kirk o’ Muir cemetery. 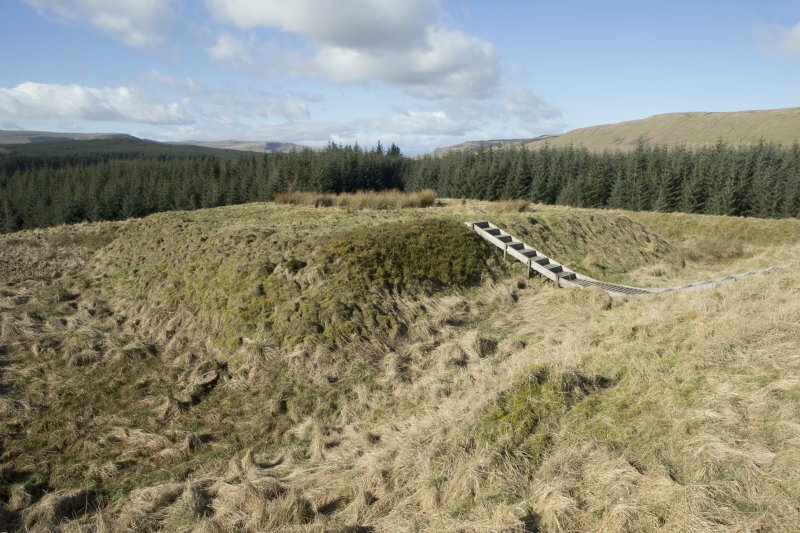 All the works were funded by the Heritage Lottery Fund as part of the Year of Heritage, History and Archaeology. 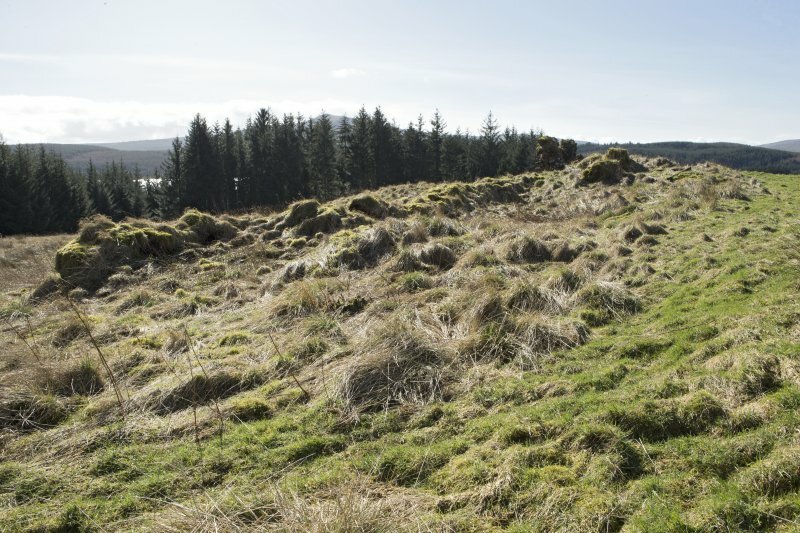 Metal detecting training at Sir John de Graham’s Castle focused on areas to the east and southeast of the site, outwith the scheduled area. 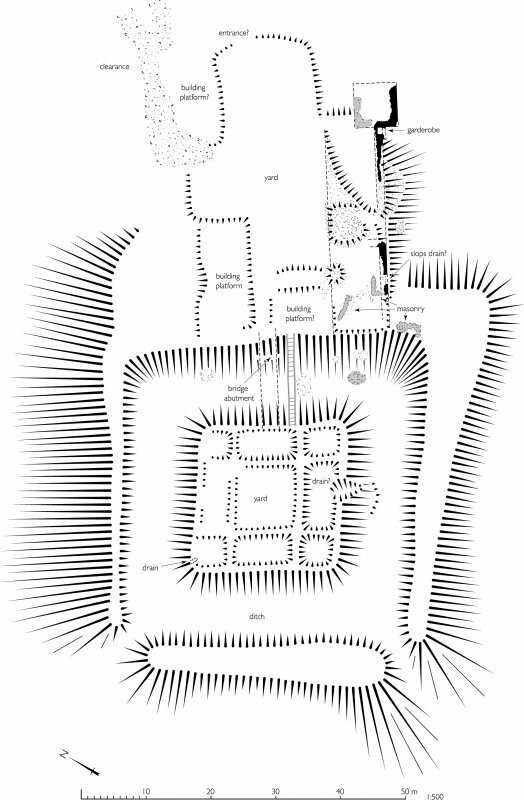 All finds were GPS located, excavated, recorded and subsequently reburied, as all were recent. 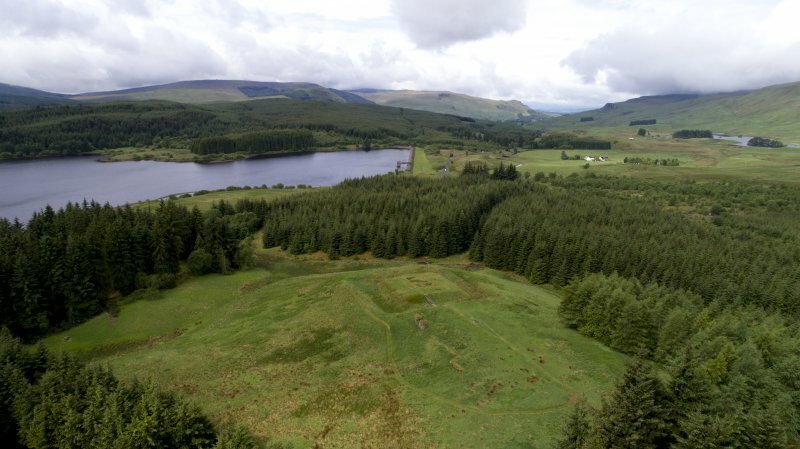 Additionally, the site was flown using SUA and 3D terrain model and contour plan of the site produced to be used in conjunction with existing HES plan to further enhance the interpretation of the site. 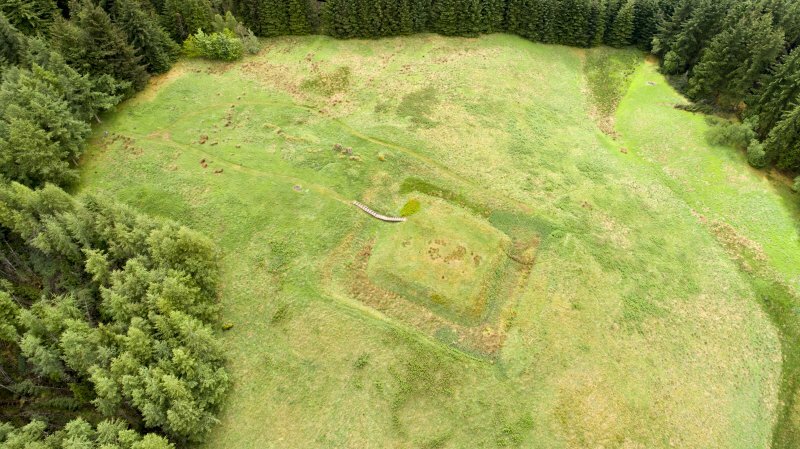 of the school structure, and uncovered significant accumulation of demolition Excavations in Trenches 2-5 failed to uncover any indisputable evidence for in situ remains of the medieval chapel. Nevertheless, the presence of demolition material, attest to its likely former presence in immediate vicinity. 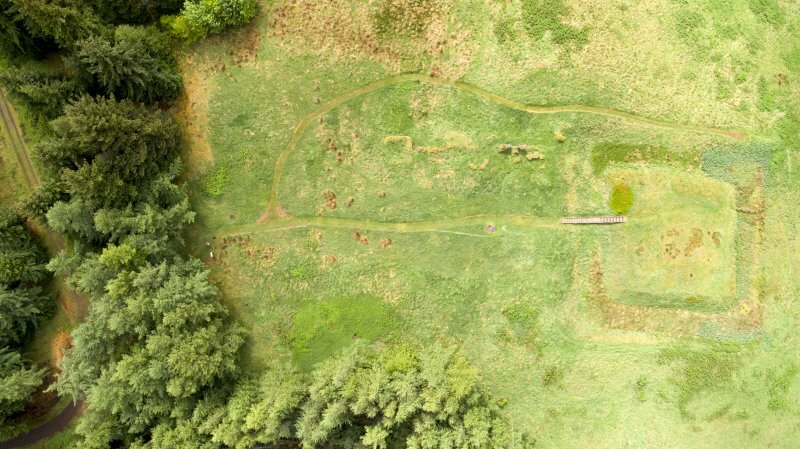 The excavations also uncovered evidence for substantial raising of the ground level in 19th century, which suggests that further, earlier remains, including the foundations of the chapel may lie buried at a considerable depth beneath this made ground. 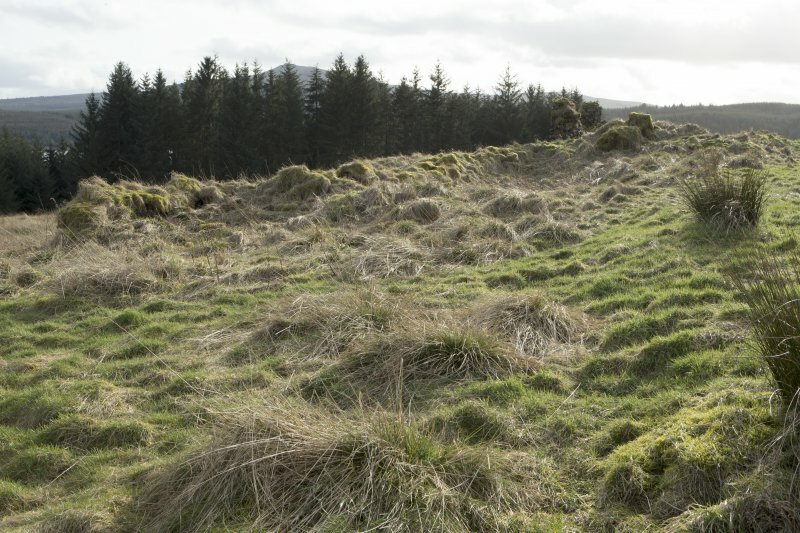 Investigations outwith the cemetery wall to the north (Trench 4) focused on apparent banked feature, which was found to be a dry-stone dyke, most likely associated with now vanished farmstead of Kirk o’ Muir, also recorded in earlier sources. In addition, graveyard survey and careful cleaning of some of the gravestones was also undertaken as part of the project, resulting in uncovering the earliest dated grave slab (1651) identified in the cemetery to date. 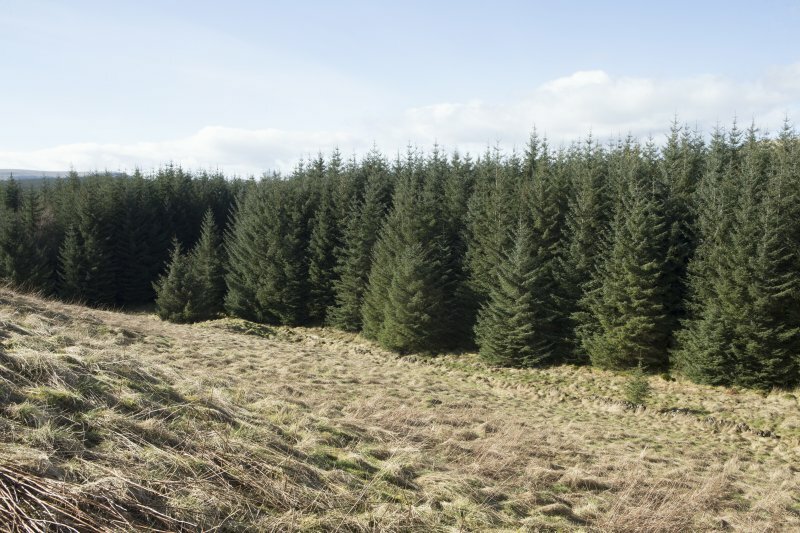 Finally, the project also involved production of an audio and soundscape diary for both sites to be used for further interpretation and to enhance the project's outcome.